A few weeks ago I visited Super 88, still one of my favorite places on earth to buy stuff I’ve never consumed before. It went about as expected; I bought a lot of insanely inexpensive frozen dumplings, a gigantic tub of miso despite promising myself I wouldn’t, and then fed Janet pork and duck in the attached food court. On my slow, slack jawed fly-by of the fish department (where I usually consider buying one of the whole carp swimming behind the counter) I saw that they had whole skate packed in ice for $1.39 a pound. Which created some anxiety. 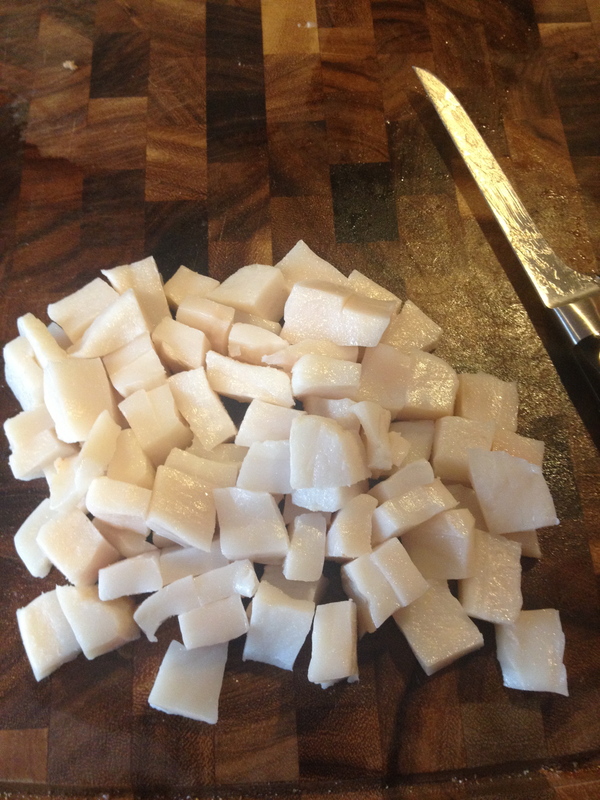 I’ve loved skate wing the few times I’ve had it in restaurants, usually pan fried with a brown butter sauce. On the other hand, skate is a ray, pees through it’s skin, and generally should be eaten extremely fresh since it gets nasty fast. 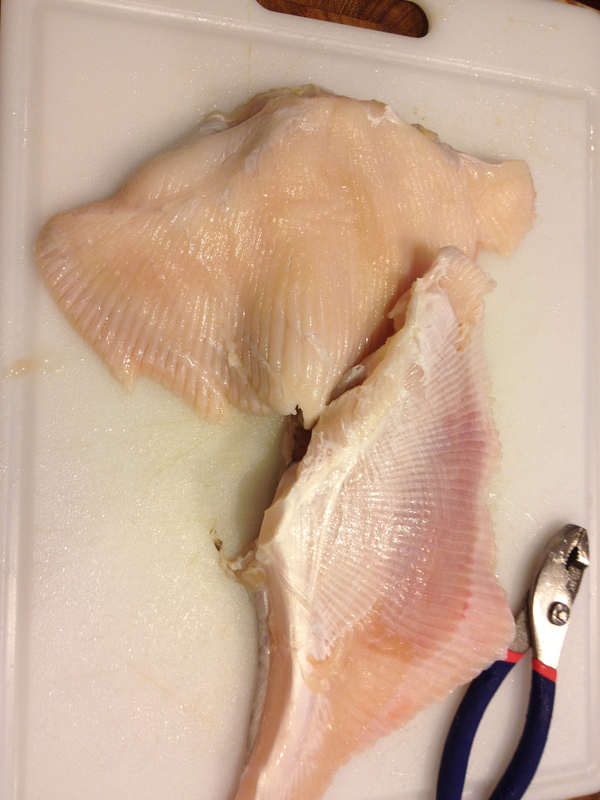 On top of all of that, the center area of the skate is mostly inedible, each wing has a band of cartilage running through the middle of the meat, and the skin is extremely difficult to peel off. Due to all of these factors, I did multiple anxious passes by the seafood case before having the courage to ask the man at the counter if he would clean the skate for me. Which he shook his head and replied “no” to. Meaning I needed to do a couple more anxious laps deep in thought. Eventually, despite my near psychotic hatred of wasting food, I decided that the minimal investment due to the per pound cost made it acceptable to take the risk. So, as the 5th lap wrapped up I asked for a skate from the same seafood counter guy who immediately asked if I wanted it cleaned. Well then. Seems like the questions work best when they are outbound at Super 88 and can be answered with just a nod. Anyhoo, he removed the wings from the skate and I headed up to wait in the extremely long line at checkout. 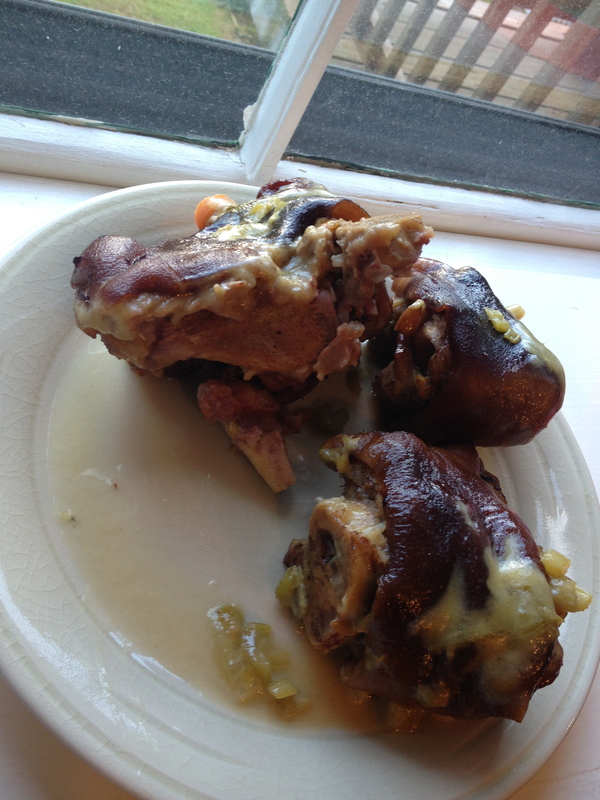 Then, of course, Janet and I went and ate a half pound of Chinese roast pork. 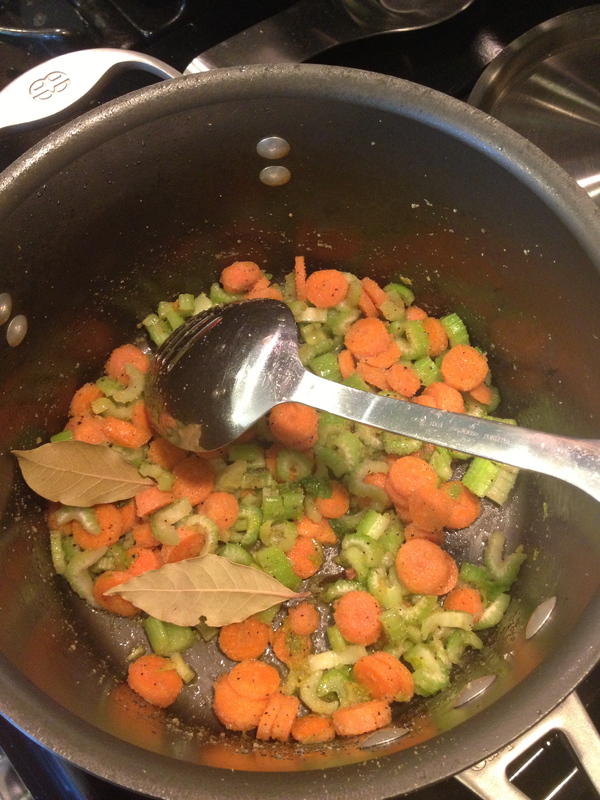 Once home, I got started on dinner. The plan was to use the miso in a corn dish that I saw on the first season of Mind of a Chef, do the skate wing in brown butter, and utilize a week old head of cauliflower in a way that completely wouldn’t match the flavors of the other items. 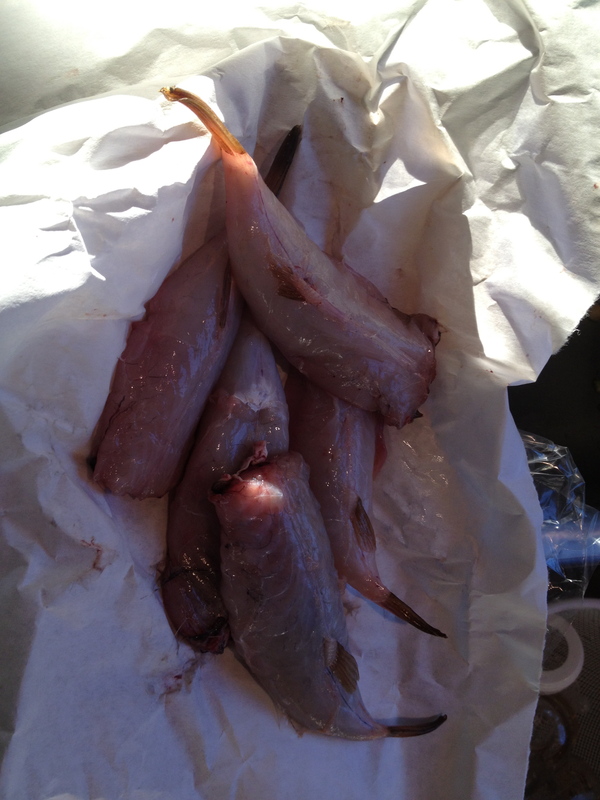 The first step, was getting my first good up close look at the fish and preparing it for cooking. I have no idea what happened in the back of Super 88 when the fishmonger went to “clean” the fish, but some things happened. Most noticeable was that the spiny edges were trimmed off, but also that he randomly chose to remove the skin on only on side of each wing. There was still a hard piece of cartilage running down the center of the wings which ended with a thick piece of bone-like cartilage at what would have been the middle of the body. Otherwise the fish looked and smelled pretty fresh, with none of the ammonia-like smell I was told to look out for. Still a lot more work left to do than I expected, though. The hardest part of dealing with skate, as I had heard and quickly learned first hand, is removing the skin which is best done with pliers and a lot of elbow grease. Especially if you have tasted soft, delicate skate wing in a restaurant, this process seems entirely ridiculous. The idea of tearing the skin off of meat seems like it would completely ruin even the toughest cuts, but with skate it actually peels away cleanly. Albeit with an insane amount of effort. I think each wing probably took 2-3 minutes or repositioning, pulling, then trying to find a new grip on the meat that wouldn’t damage it, and pulling some more. I know I am painting a very encouraging picture for giving this a shot at home. After a lot of effort, I had a couple clean wings. 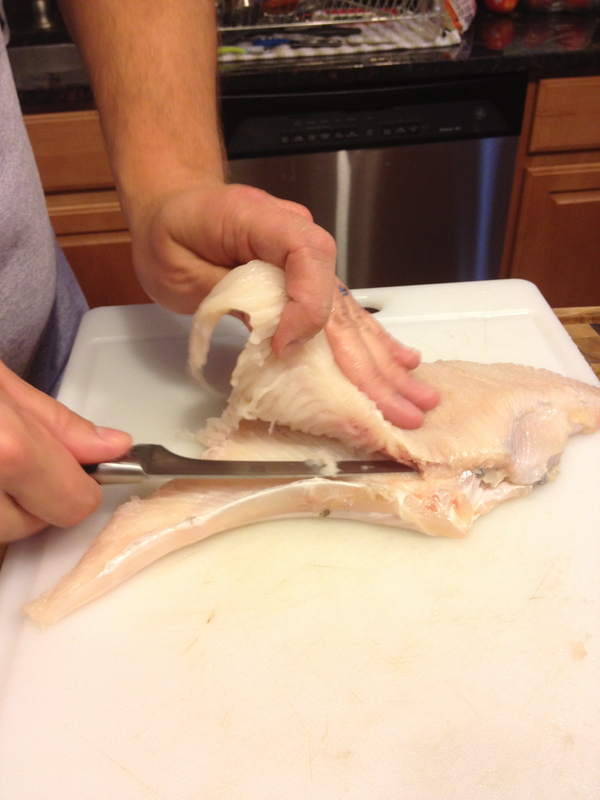 The last step in prepping the fish was to fillet the meat off of the cartilage that ran down the center of each wing. 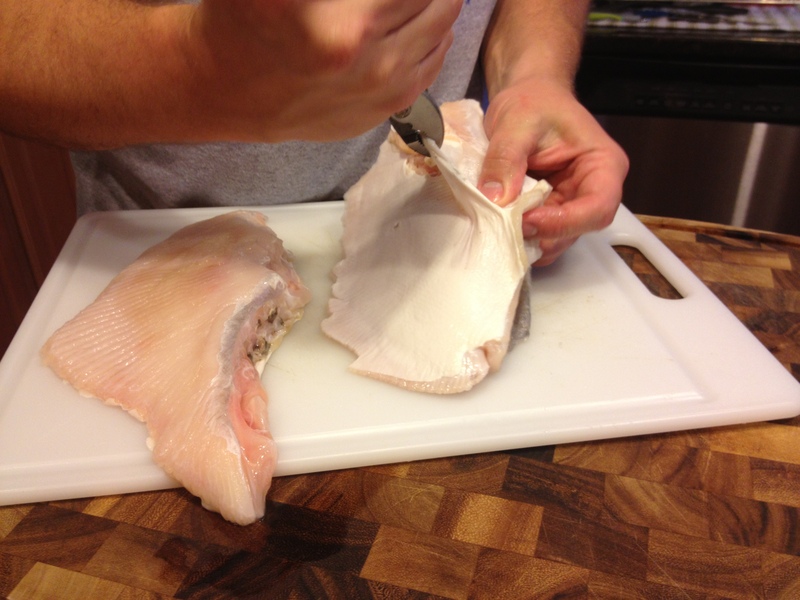 I took the same approach I would with a whole fish and cut down to the bone, then used it to guide the knife down the fillet. 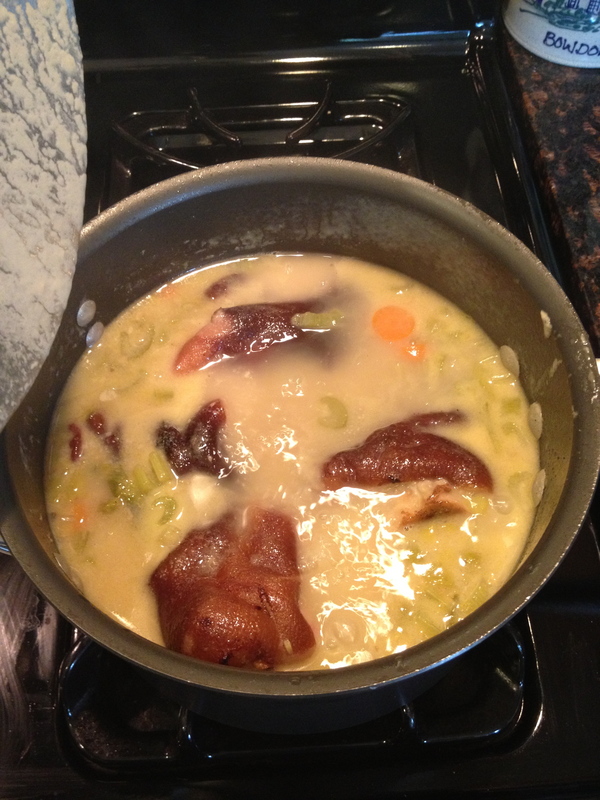 I’ll give myself a B- here and would probably boil the remaining meat stuck on the bone in a soup next time. 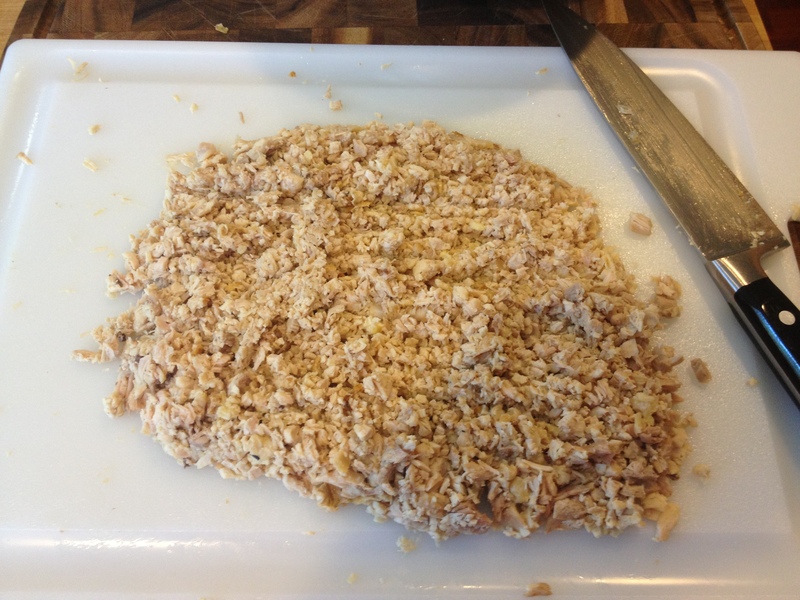 With the fish fully prepped, I got started with the other parts of the meal by mixing equal parts unsalted butter and miso paste. 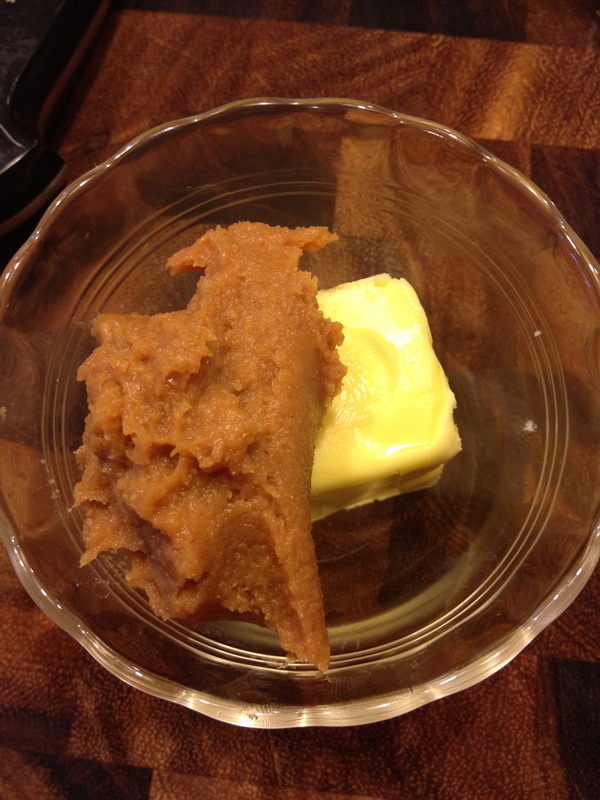 I used a fork to mash the miso and butter together until they were relatively well combined. 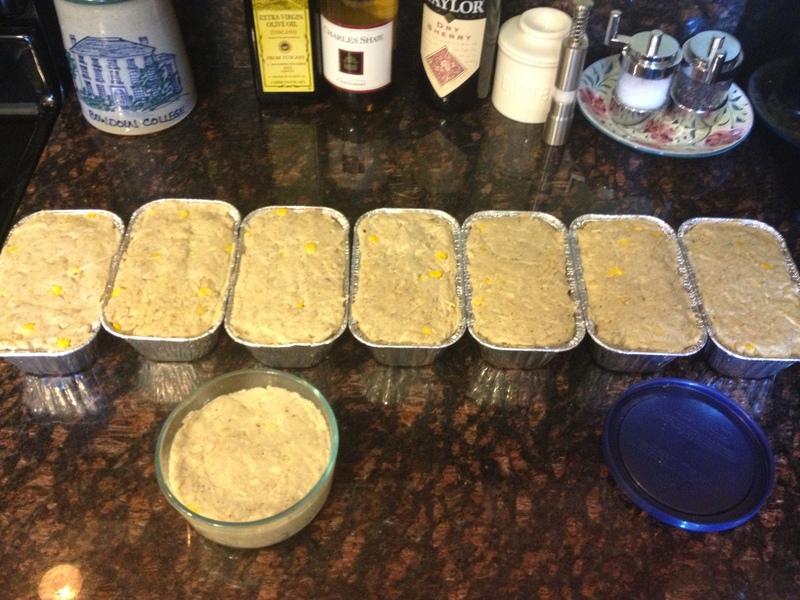 Once finished, I got started cutting the corn off of six cobs for some pan roasting. 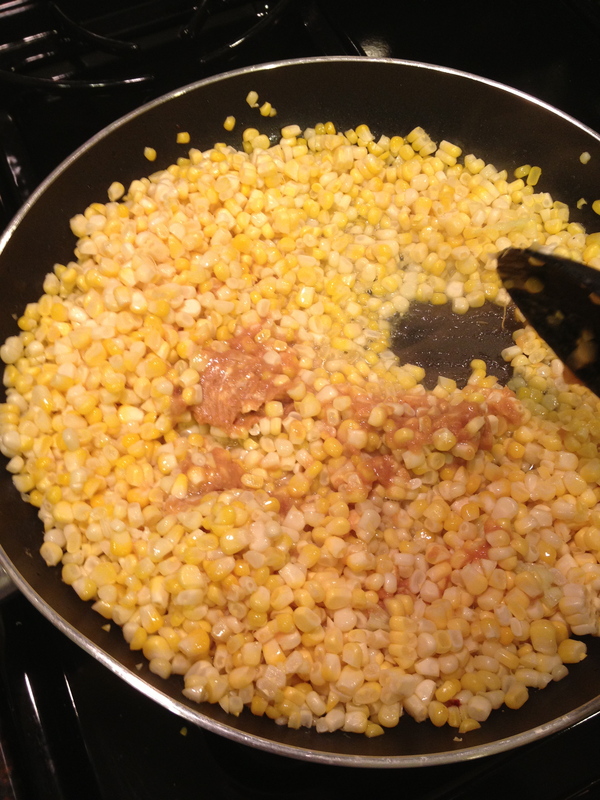 I got the idea for this method of preparing corn after watching a mouth watering episode of Mind fo a Chef Season 1. That corn was prepared with huge chunks of bacon in that case and finished with miso butter. Makes my mouth water writing it. The last side, and one that fit in most poorly with the others, was a roasted cauliflower dish based on one I’ve had a few times at Ten Tables in JP. It started with preheating the oven to 475F and tossing a broken down head of cauliflower with olive oil, balsamic, salt, pepper, currants, and sunflower nuts. 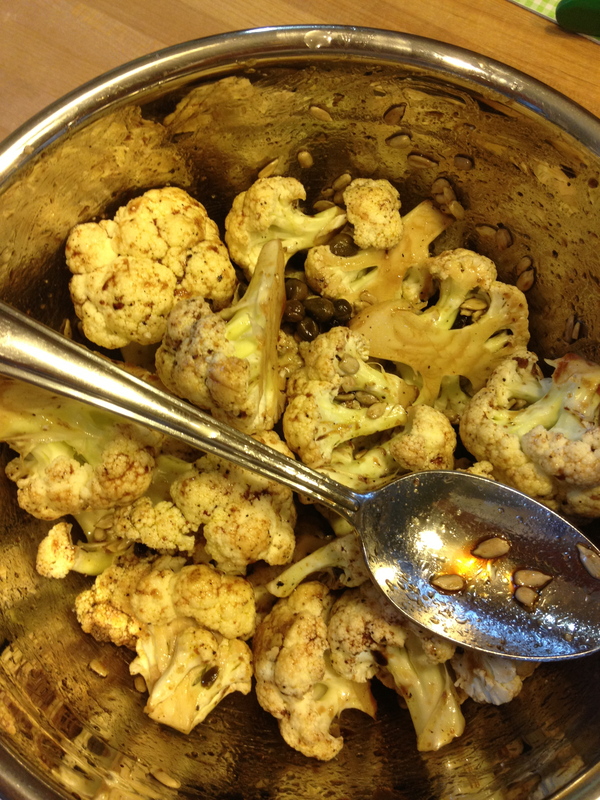 The dressed cauliflower went into the oven for 20 minutes to get some good roasted color and texture. 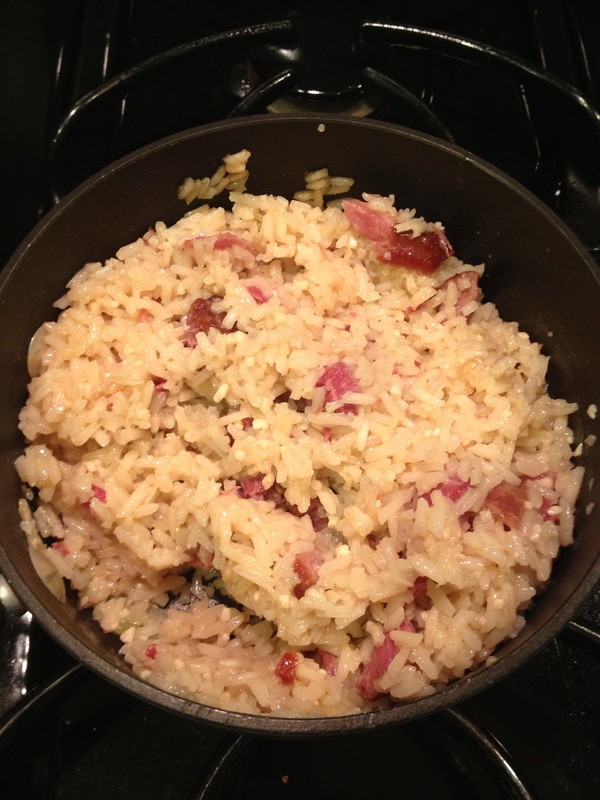 While that cooked, I heated up a couple tablespoons of bacon grease in a large pan for my version of the miso corn. Bacon pieces would have been better, but I didn’t feel like taking the time to cook it properly, so bacon grease was the call. Once the grease was hot and nearly smoking, I added the corn, tossed and cooked it for a minute or two, then added the miso butter. With the corn cooking, I heated a large cast iron pan over medium/high heat and melted a few tablespoons of butter in it once it got up to heat. 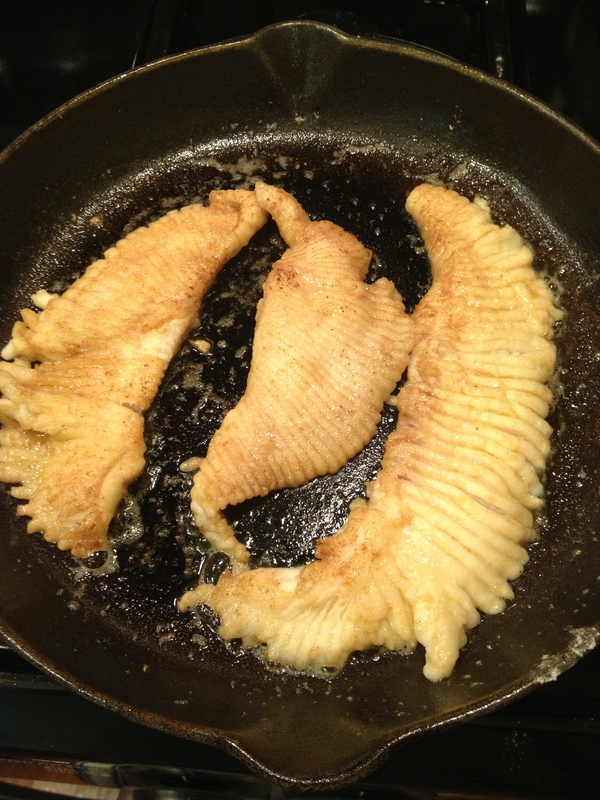 While the butter melted and started bubbling, I lightly floured and seasoned the skate fillets before adding them to the pan. This is actually after the flip. 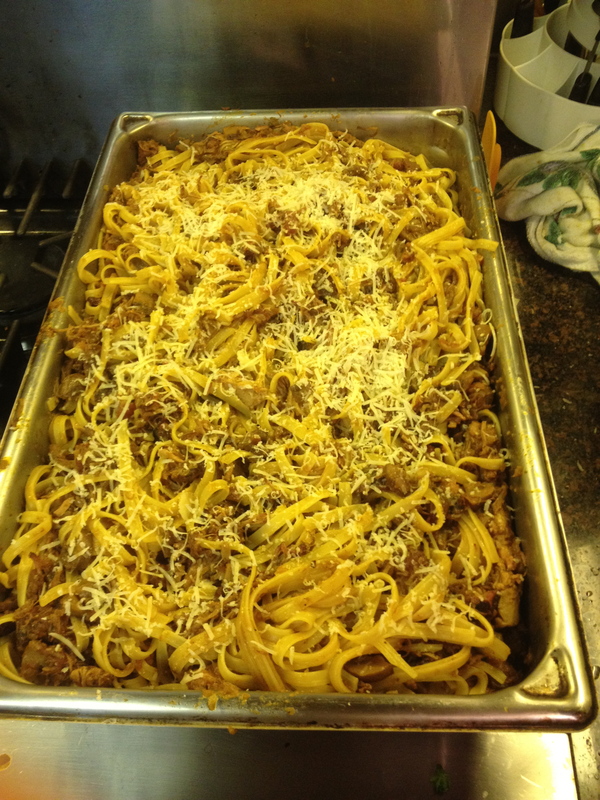 Having slightly too much food for one pan load is just the worst. Four fillets when three will fit felt like when you’ve been cooking bacon for a half hour and have just two strips left that need to be cooked on their own. The worst! 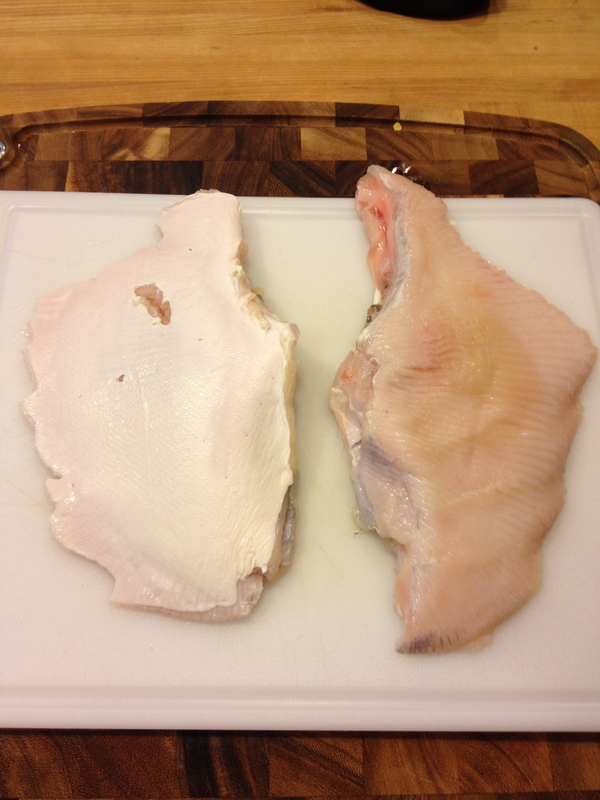 The skate cooked for a few minutes on each side, basically until the outside had a nice browned color. By the end, the skate was falling apart tender and a little difficult to keep whole but I was succesful for the most part. Once the meat was out of the pan, I turned the heat up a bit to brown the remaining butter in the pan and then deglazed the pan with a splash of white wine. After a couple more minutes of reducing the wine sauce, I added the fish back to the pan and plated. Skate is a fish that every fish lover needs to try, regardless of your feelings about the idea of eating a ray. 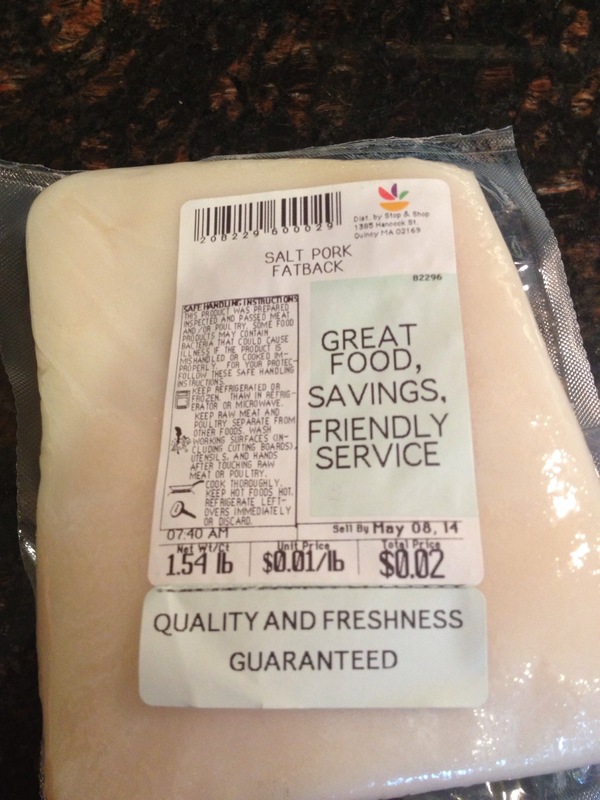 The flavor is mild but as sweet as a scallop, and the texture is incredibly light and almost feathery. You can choose your own difficulty level, getting the partially cleaned buck-fifty version from an Asian supermarket or the $14.99 full cleaned fillets from a reputable seafood market, but it is incredibly easy to cook regardless. This version, with brown butter, had the nice contrast between the sweet meat and the sharper flavors of the sauce, and was very delicious. The corn was sweet, bacony and salty miso-y which I loved and I think Kristi was middies on. 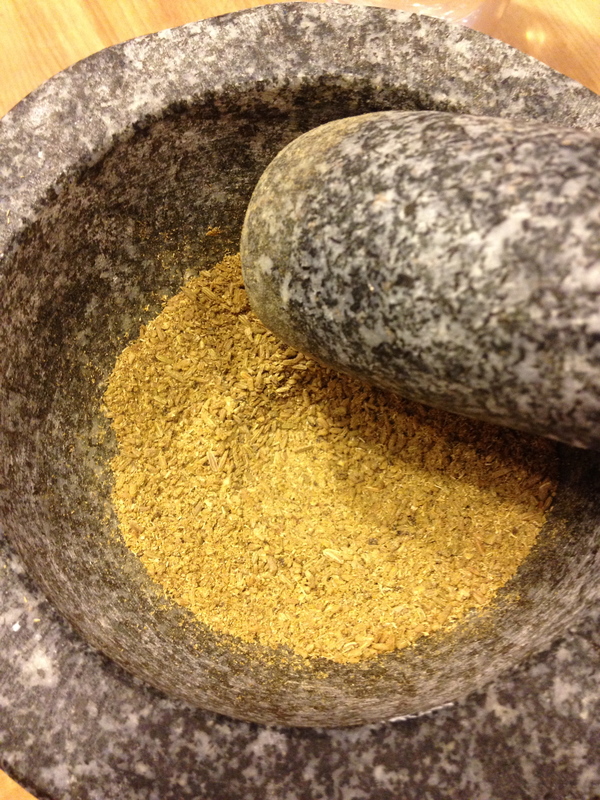 I just love the flavor of miso and this was a combination of my favorite ingredients. 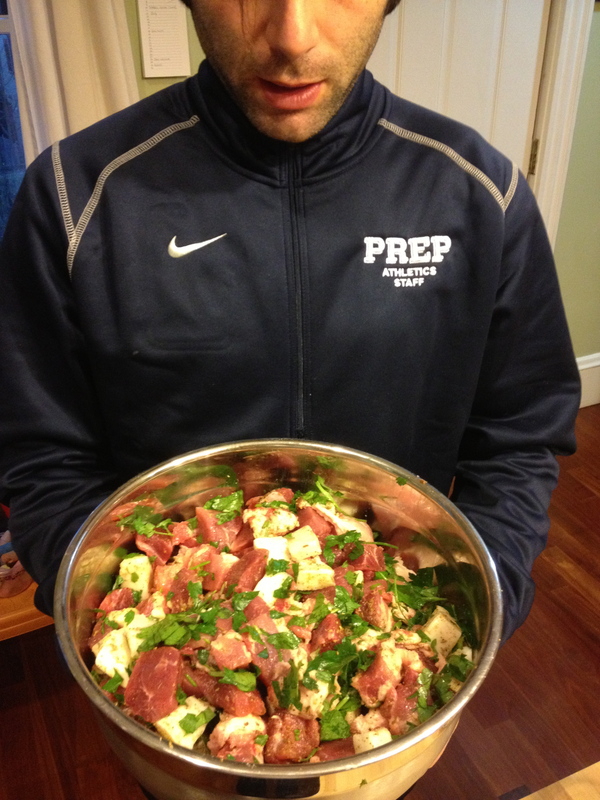 Would have been better with some cilantro to cut the richness, though. The cauliflower was very simple but delicious and had a nice crispy char from the roasting and balsamic sugars burning slightly on the surface. Very good meal, I got some game offal to cook for next week. Beef jerky and me go way back. Surprising, I know, that a salt obsessed portly carnivore has had a lifelong affinity for jerky. As a kid, I spent my summers hanging around Ravine Lake and throwing in a buck or two every day for snacks like giant Jolly Ranchers, blow pops, and Munchos. Weren’t Munchos the best? In the rotation was the occasional day where we picked through the questionable jerky selection at the Copper Kettle and every kid sat around snacking on dried meats. I was basically the same then as I am now; acting like an expert and aficionado of my Jacks Links kippered beefsteaks while the cretins around me consumed their Slim Jims. Mine was the real beef jerky, the authentic one, and I made sure I let everyone know about it. I was probably 8 so, again, nothing has changed. 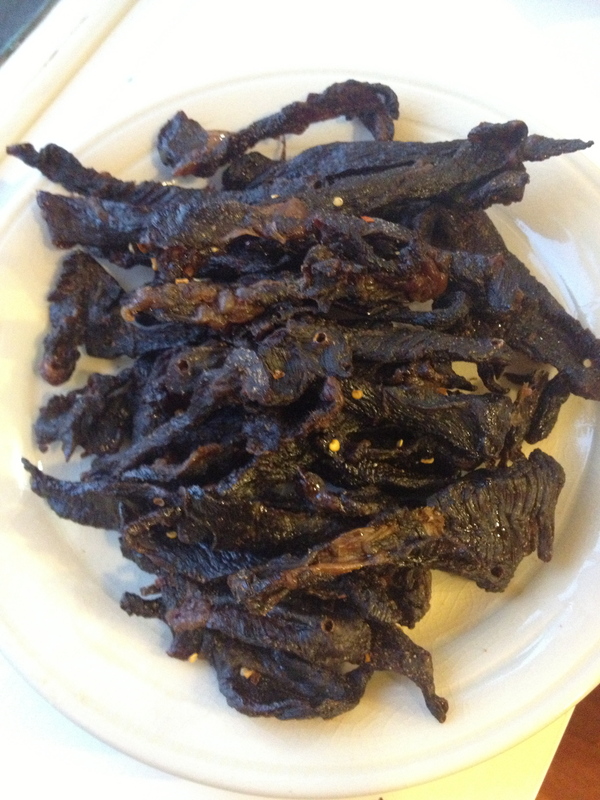 In college, housemate Davey’s father came to visit and brought with him a large bag of elk jerky he made after a recent hunting trip. It was delicious and he pretty much blew my mind when he explained to me that he had made it in his oven using a little liquid smoke. Whatever that meant. 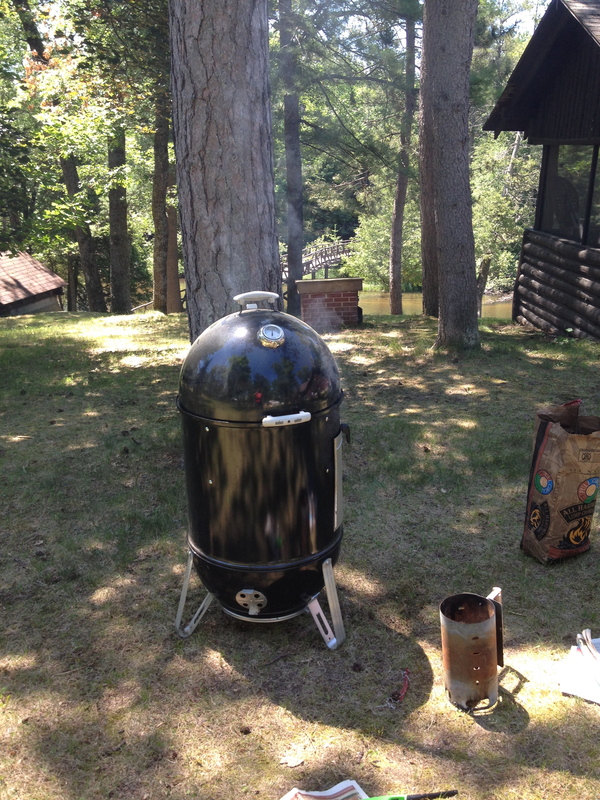 Even if I didn’t understand that liquid smoke was a real thing that didn’t just exist in Mr. Johnston’s pantry and the Flaming Homer on the Simpsons, I was very intrigued with making it myself. And a brief 11 years later, I decided to do just that. 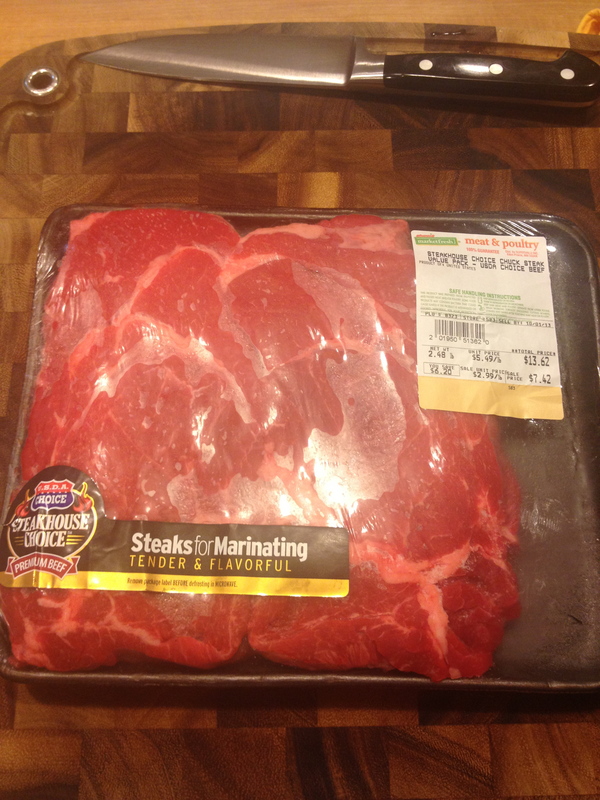 I got started with the cheapest thick cut steak I could find at the grocery store. 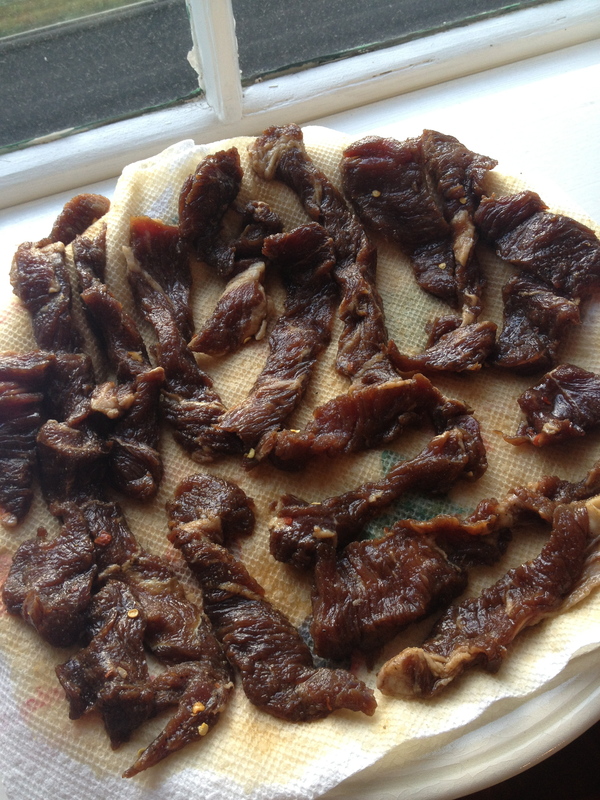 Making jerky is right up my alley since it takes something inexpensive and turns it into something tasty. I went with chuck steaks since they were on sale. Since then I have also used round steaks (since they were on sale that time) and you could probably slice whatever cheap roast is available. Since the end product is supposed to be chewy, no need to be picky. You do want to avoid an cut where you can’t easily trim off the fat since fat doesn’t dry and makes the end product not last as long. 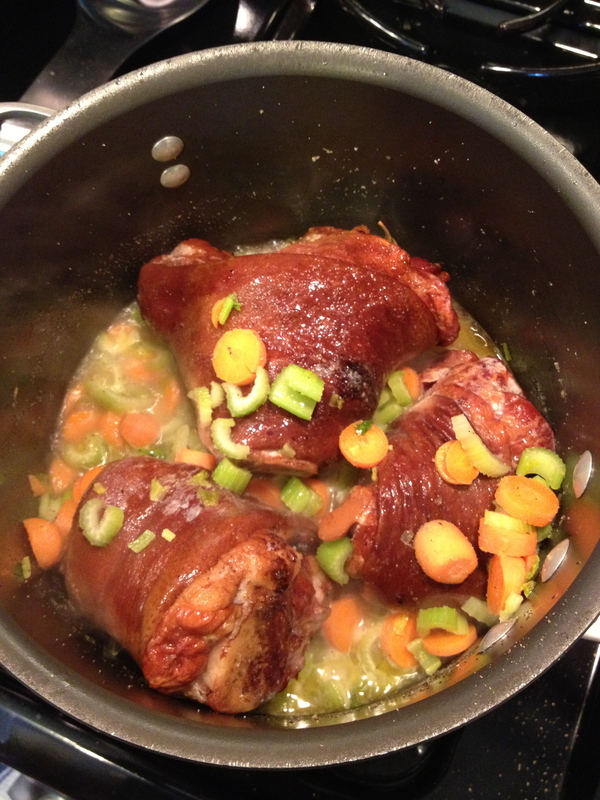 The meat sat in the freezer for a little under an hour to make it firm and easy to slice. 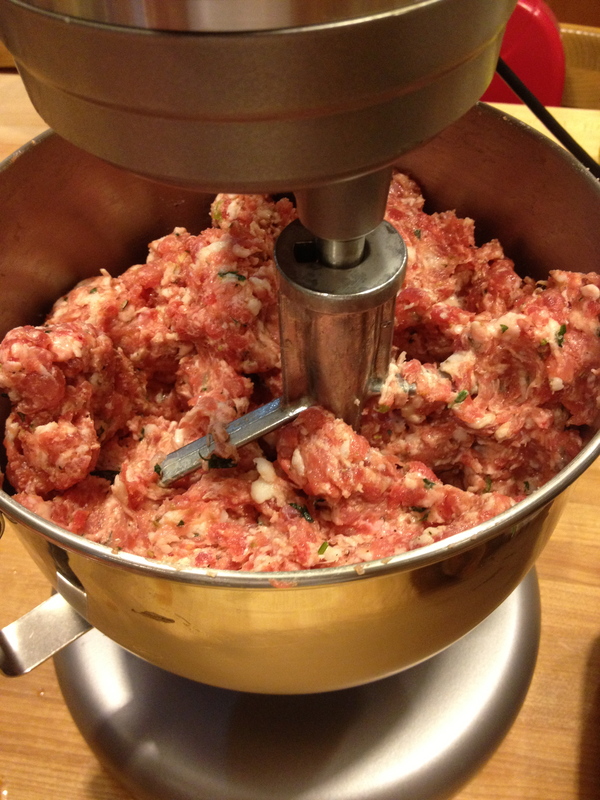 With chuck in particular the fat makes the meat less dense and difficult to slice thinly with a knife. The freezer time helps it stay together a bit better, though I still struggled to cut slices 1/8th of an inch thick. 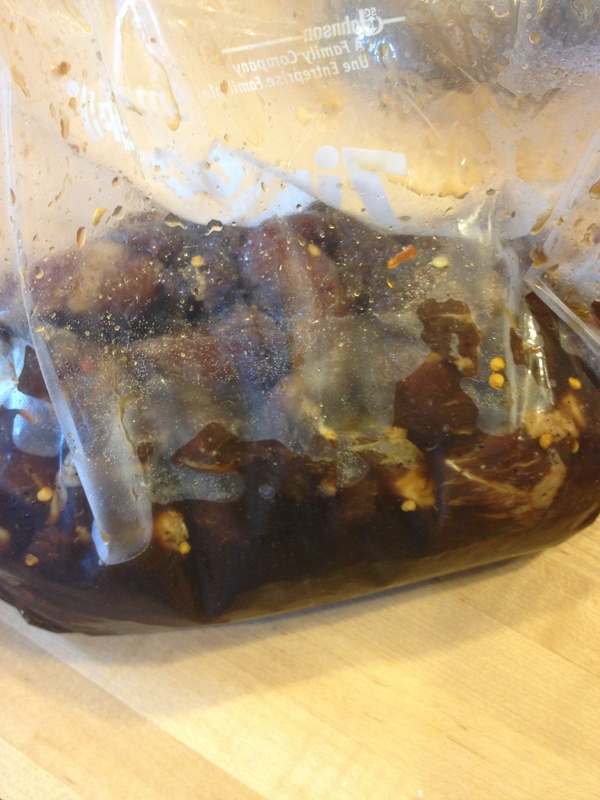 The slices went into a freezer bag with a marinade of soy sauce, brown sugar, worcestershire, liquid smoke, onion powder, garlic powder, cayenne, nutmeg, and crushed red pepper. 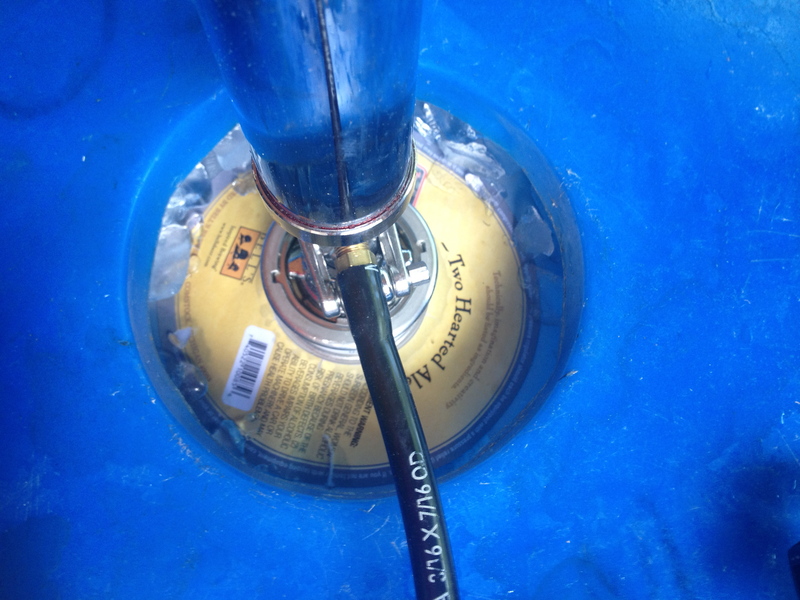 All excess air in the bag was pressed out before sealing. 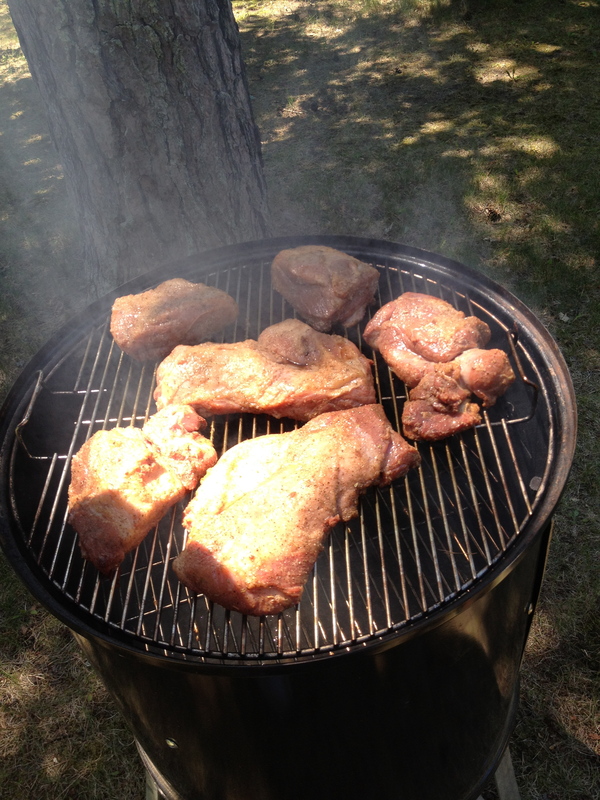 The meat sat in the marinade for 12 hours to hopefully soak up as much of the flavor as possible. Over the course of that twelve hours I took time to open the fridge, awkwardly massage the marinade around, stare at the meat for a few minutes, then eventually put the bag back in the fridge. After 12 hours, the slices came out of the marinade and I laid them out on a few separate plates lines with paper towels to drain off the excess liquid. 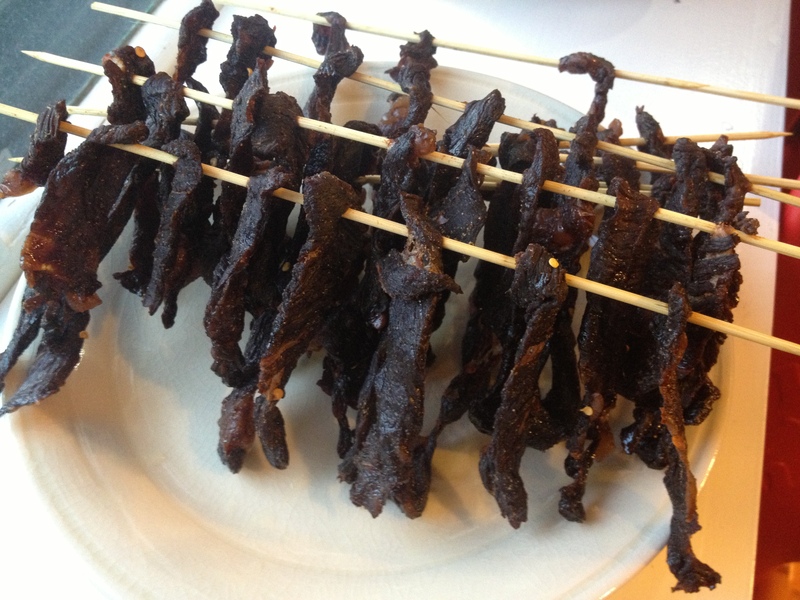 Since jerky is just dehydrated/dried beef, any extra liquid left on the meat just makes the dehydration process take longer. So, it’s good to give some paper towel time. While the meat drained, I preheated my oven to 185F (it didn’t take long) and moved my oven racks to the highest and lowest placements. I put two baking sheets on the lower rack to make sure the entire bottom oven was blocked from drips coming down. I already have enough issues with my oven smoking due to browning meat inches from the broiler, I didn’t need burnt jerk stank adding to the potpourri. Once that was all set, I took a handful of bamboo skewers out and started hanging each piece of beef from one end, spaced about a half inch apart on the skewer. Each skewer could hold about 6-8 slices of beef. The idea is that the skewers would lie perpendicular to the wire racks in the oven with each slice of meat hanging down between the wire racks. Visuals help. The hanging beef went into the oven at 185F with an oven mitt wedged in the door so it would stay slightly ajar. 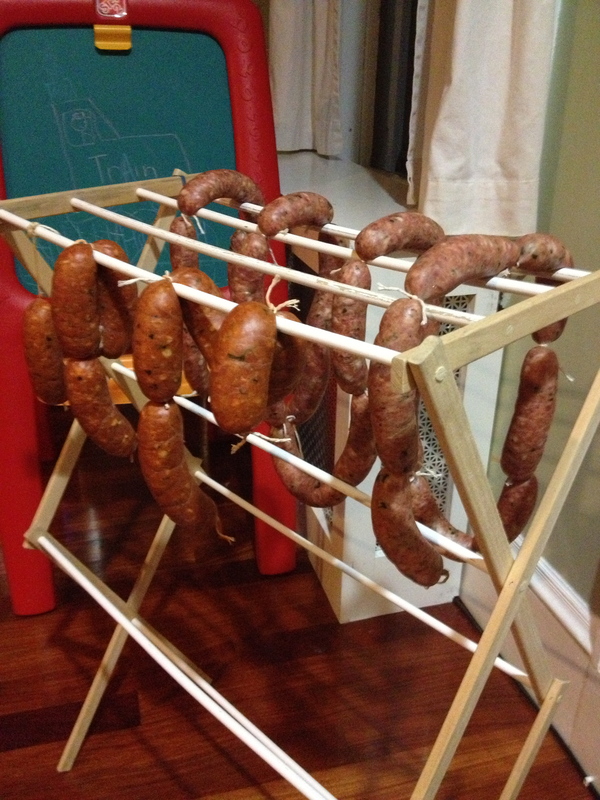 I hadn’t thought of this before seeing a comment about it on the internets, but in order to make jerky you need to let the moisture vent out of the oven or the meat will never dry. The door being open allows air flow so that can happen. Look at me going all Bill Nye on y’all!!! Aside from the oven mitt, there isn’t much you need to do while beef jerky cooks. Eventually, somewhere between 8 and 12 hours of drying you have this. This is about the point that I pulled the meat out of the oven for good, I think it had been just under 10 hours. 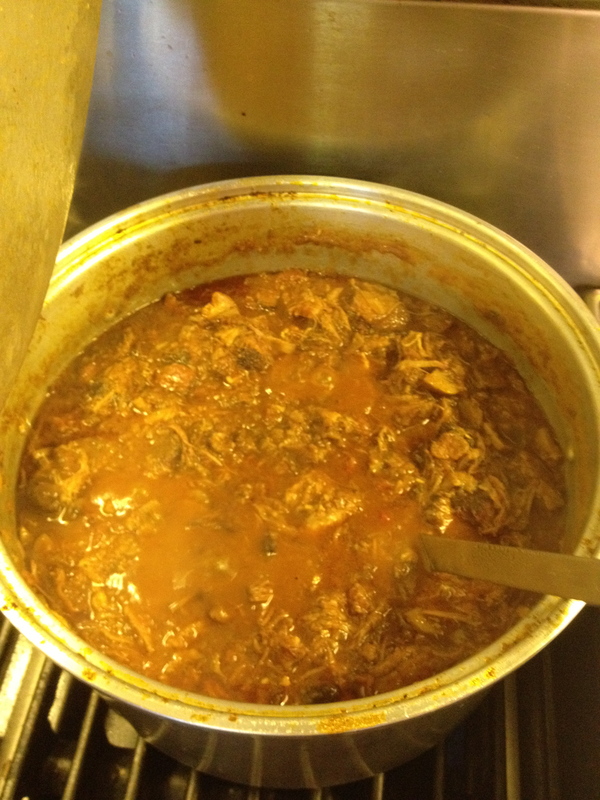 I knew the meat was ready because the exterior felt solid and had only the slightest amount of give when squeezed. I also tried a piece and it had reached the right point where there was still a little moisture to the meat, but drying it any further would make it leather. 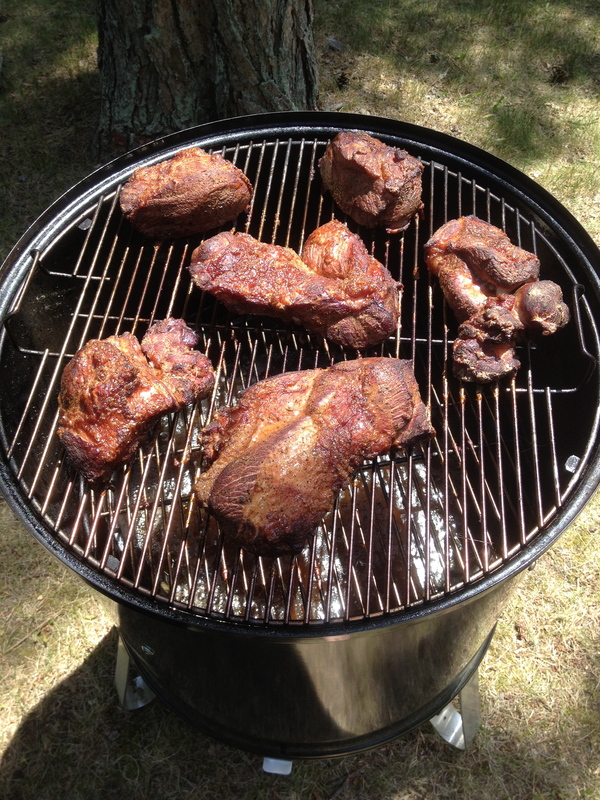 I removed the skewers and piled the meat up to cool. 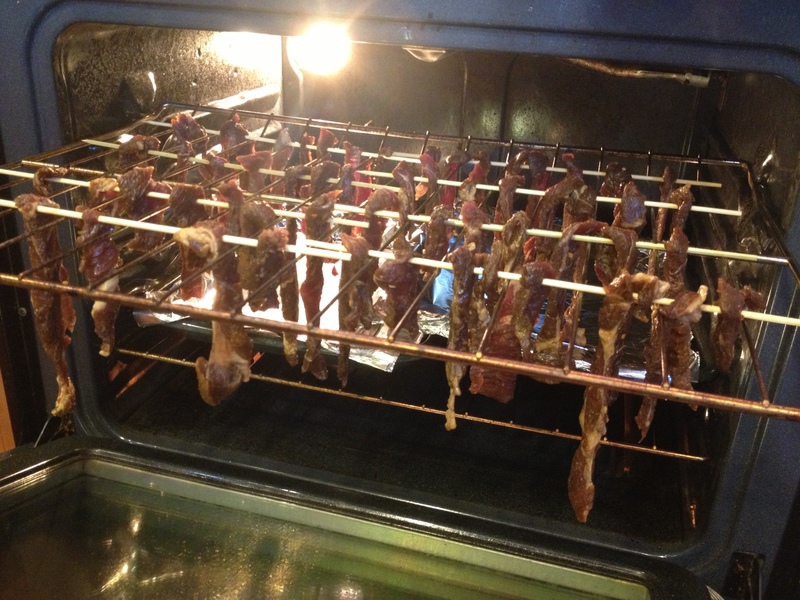 Before the jerky cools completely, you have to remove the skewers to make sure they don’t get stuck and leave behind wood slivers in the meat. Jerky splinters would be bad. 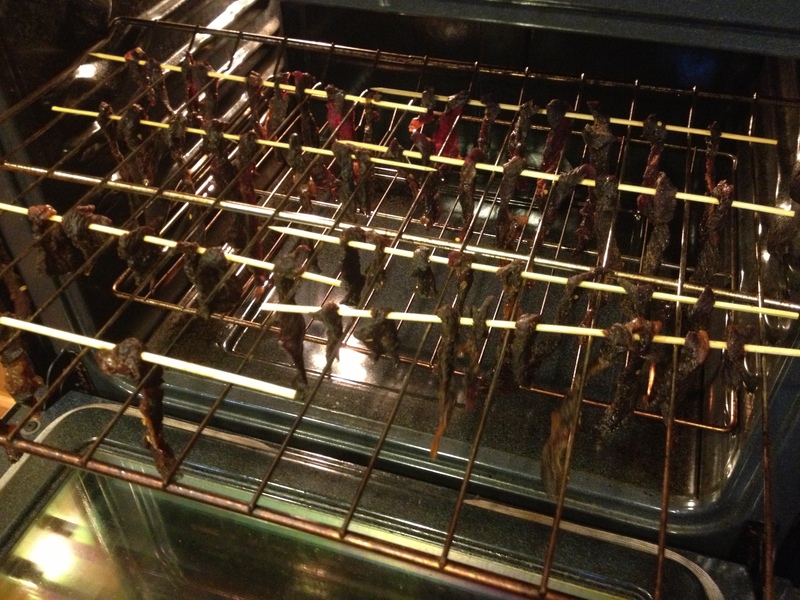 For reference, skewer removal is the part of the process where you end up eating about half the jerky. Once you’re done with that, the jerky needs to cool completely before it can be transferred to a storage container and the refrigerator. Making sure the jerky is completely cool before it goes in the fridge is important because it avoids condensation forming in the bag. Condensation would lead to your jerky rehydrating. As long as you avoid that, the jerky can keep in your fridge for 3-4 weeks supposedly, but I’ve never had the restraint to let mine last long enough to find out. 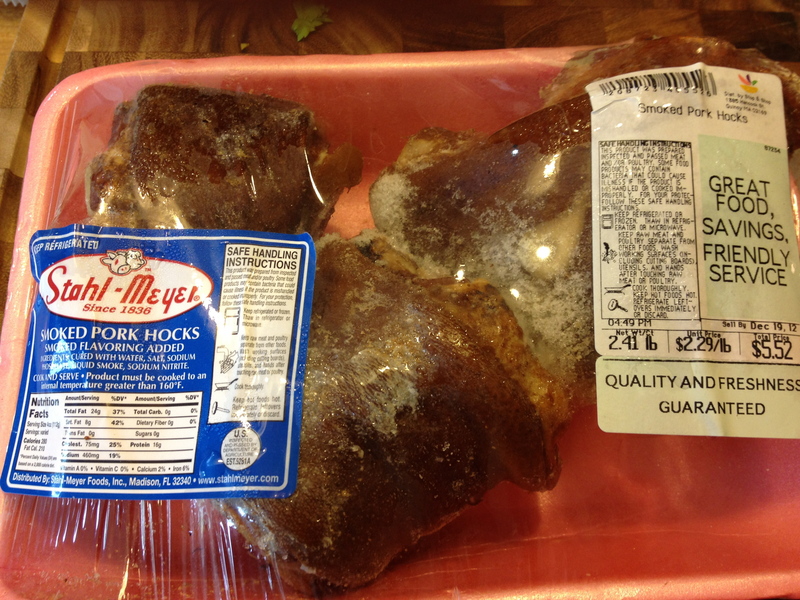 I won’t try to compare this to store-bought jerky because it is very different beast. The outside of the meat is hard and crunchy, almost like biting down on a stick, but the meat gives almost immediately in your mouth. It ends up being much easier to chew than your initial expectations. Also, there’s none of that weird greasy exterior that happens with bagged jerky, nor the paper thin pieces that feel like you are chewing on a latex glove. Lastly, the flavor is much better; it tastes like real beef and real ingredient. You can make it as sweet or spicy as you want (I recommend siracha in the marinade) and it is fun to experiment a bit. 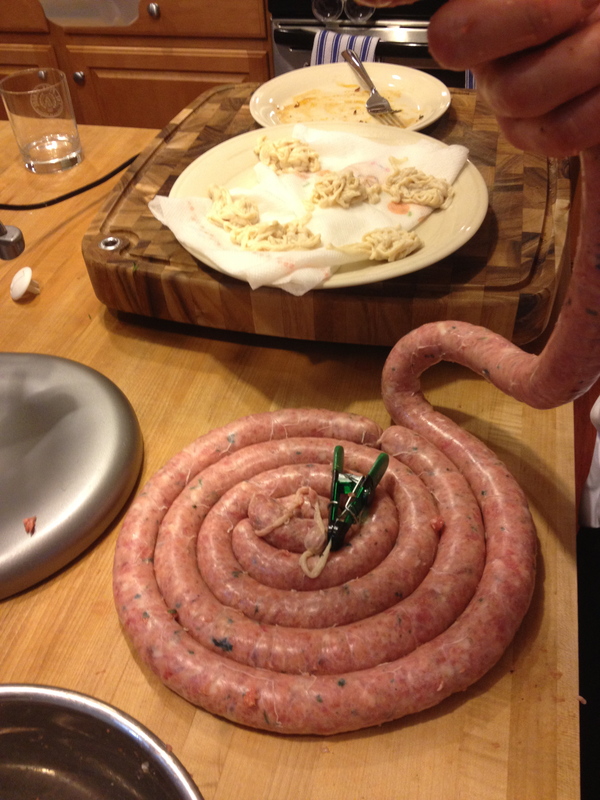 I’ve previously referred to how my cooking interests follow a similar cyclical approach to flight patterns. When you live near an airport, sometimes your home is under the pattern for a few weeks, then it just goes away and you barely notice. 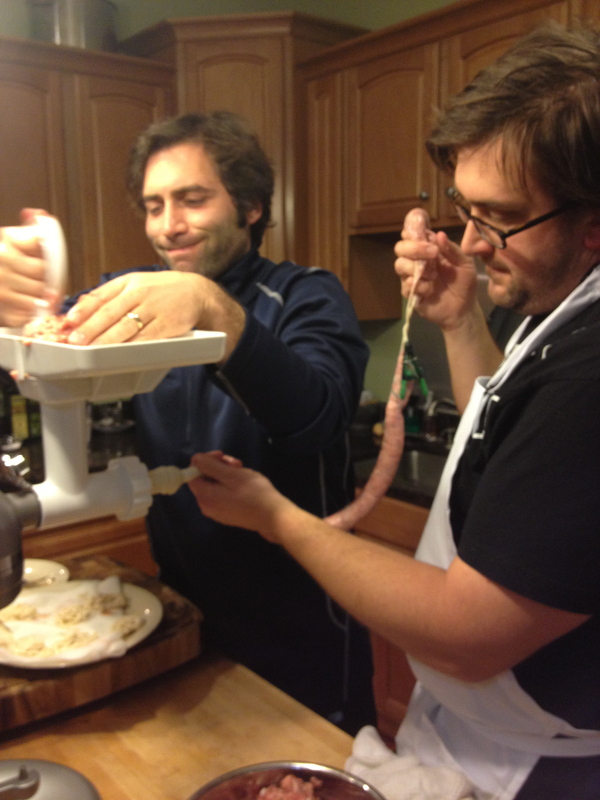 The potential for scrapple to be made with other primary ingredients than hog innards is an idea I’ve been thinking about about a lot recently. 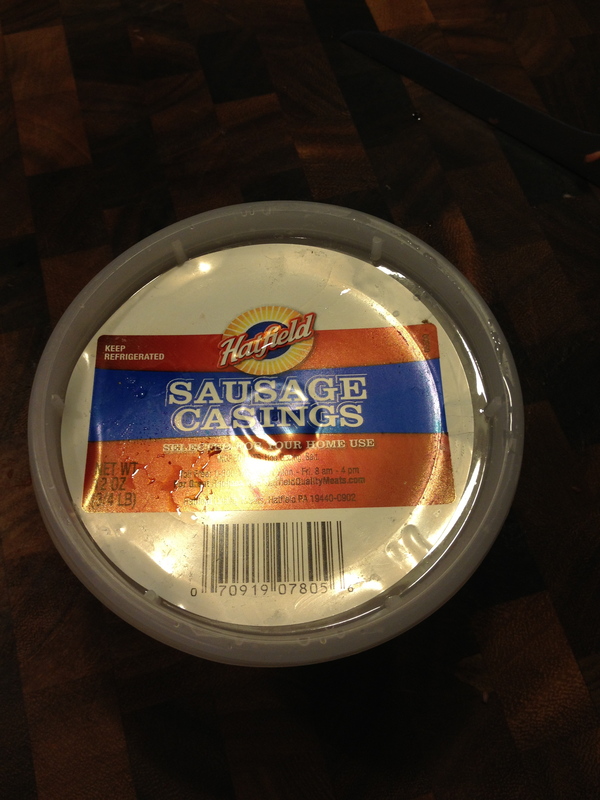 I’ve mostly been focused on how I can use scrapple to hide vegetables from Janet and package them in a crispy form that she has shown a love for in the past. 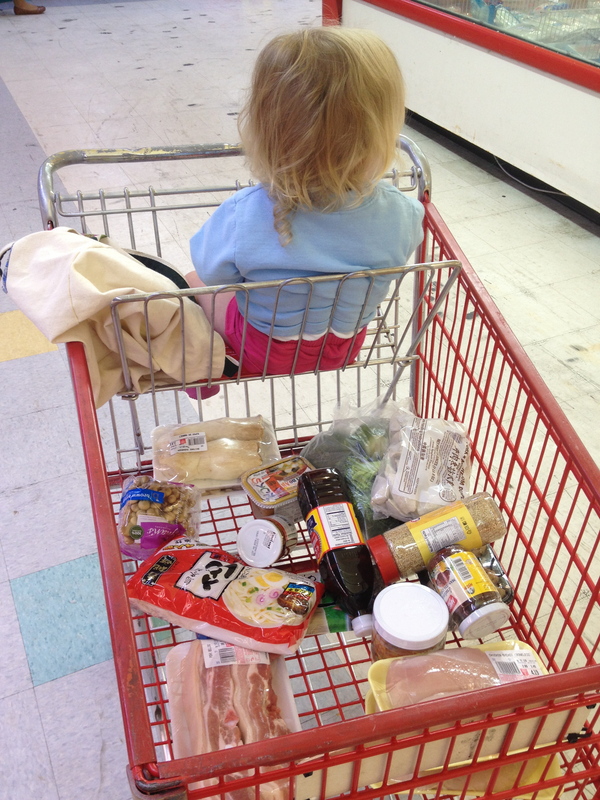 Parenting is mostly about deception and force feeding. 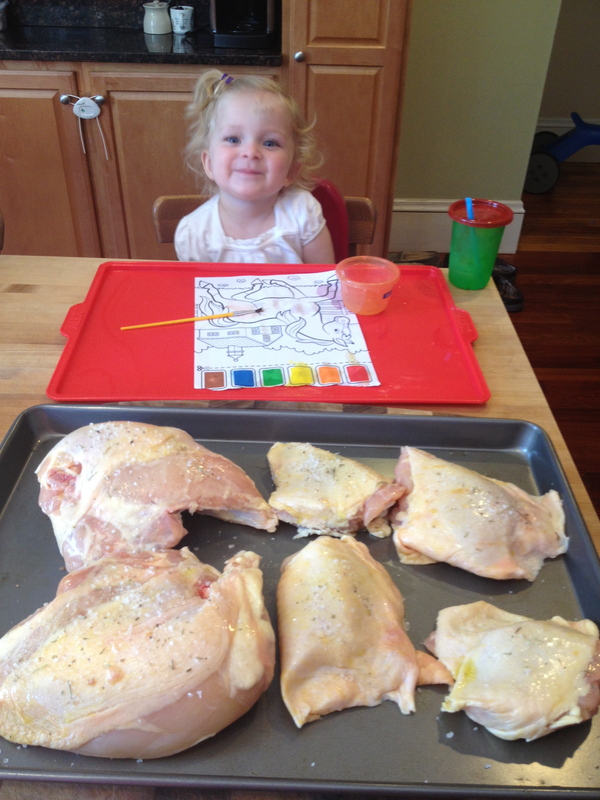 A couple weeks ago a friend from business school asked about ways to add meat to an infant’s diet which made me think of the subject of this post. I think of this as chicken scrapple, but as my wedding caterer said, scrapple is just pork polenta, so you could really think of this as chicken polenta too. My main goal was to make something that was close enough to regular scrapple that I still enjoyed it but also use ingredients Kristi would be willing to consume. 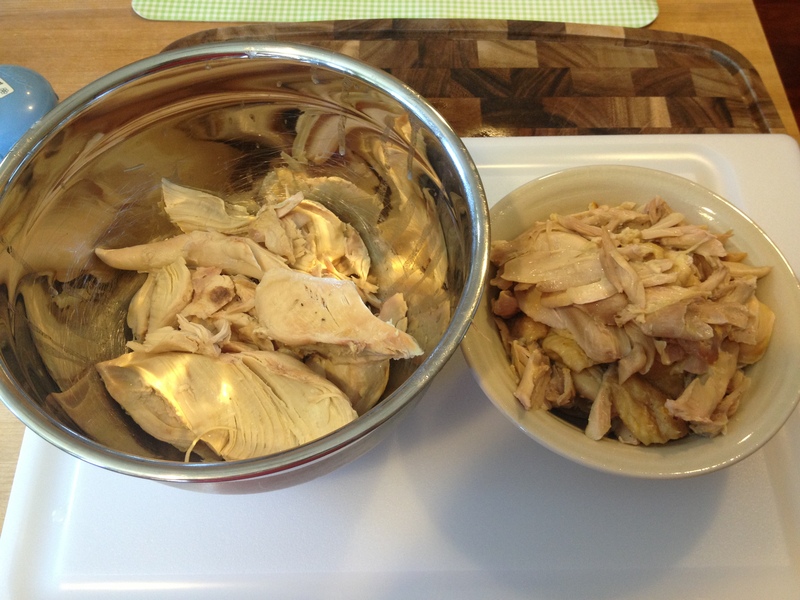 It all started with a couple chicken breasts and four thighs, all skin on and bone-in. 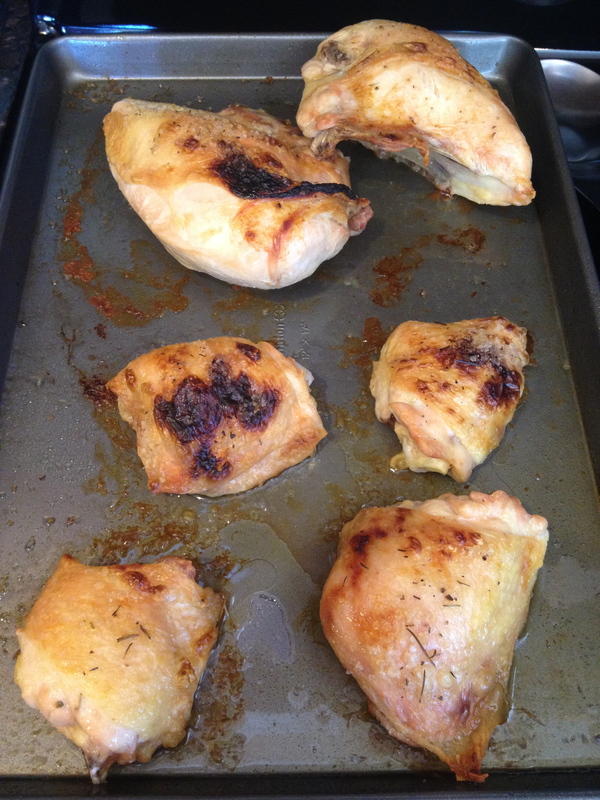 Each piece got a little drizzle of olive oil and a sprinkle of butcher salt then headed into a 450F oven to brown. After just over 10 minutes I had this. 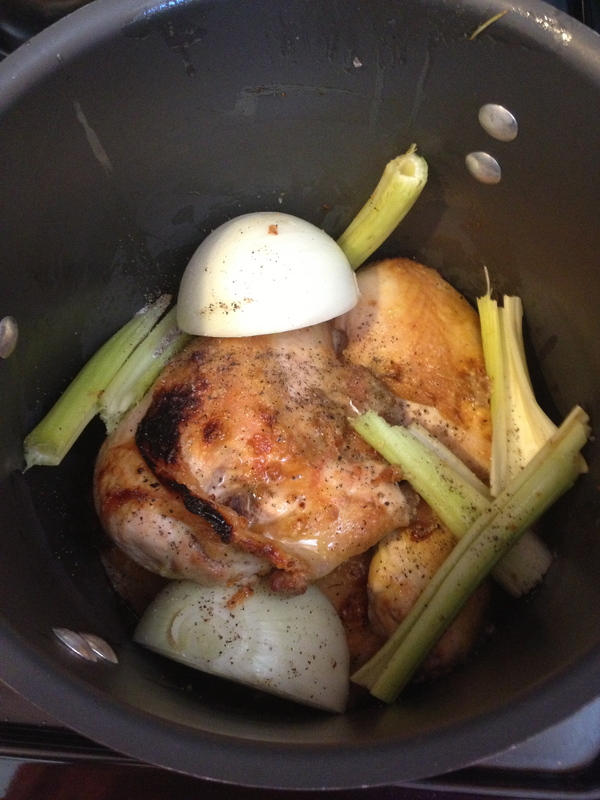 The chicken and grease all headed into the stockpot with some celery, a halved onion, a bay leaf, smashed garlic cloves, sea salt, and black pepper. 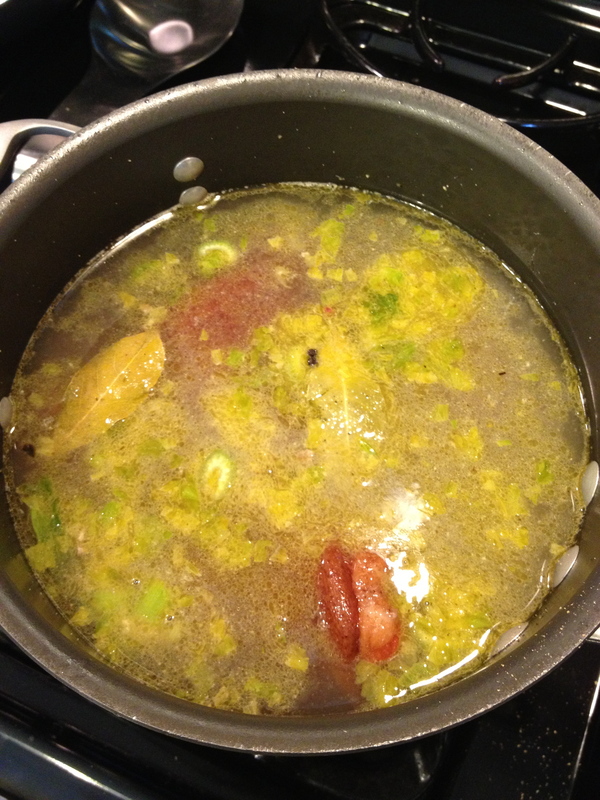 The idea was to make a stock in the process of cooking the chicken that would give the scrapple lots of flavor when mixed with the corn meal. 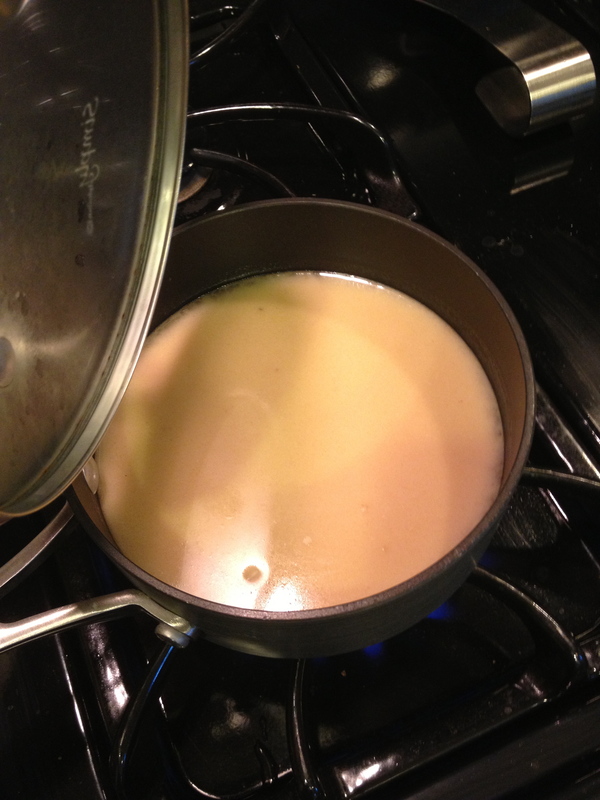 I added about 10 cups of water to fully cover the contents of the pot then turned the heat on the burner up to high. 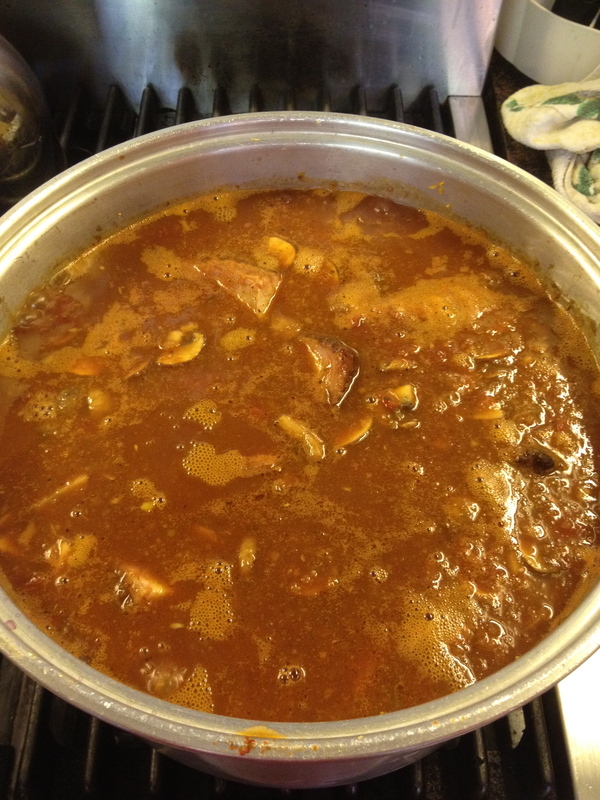 I brought the contents of the stock pot up to a low boil then reduced the heat as low as it would go, put the lid on, and let it simmer for an hour. After an hour I removed all of the meat and aromatics from the cooking liquid and discarded the celery, garlic, bay leaf, and half the onion. 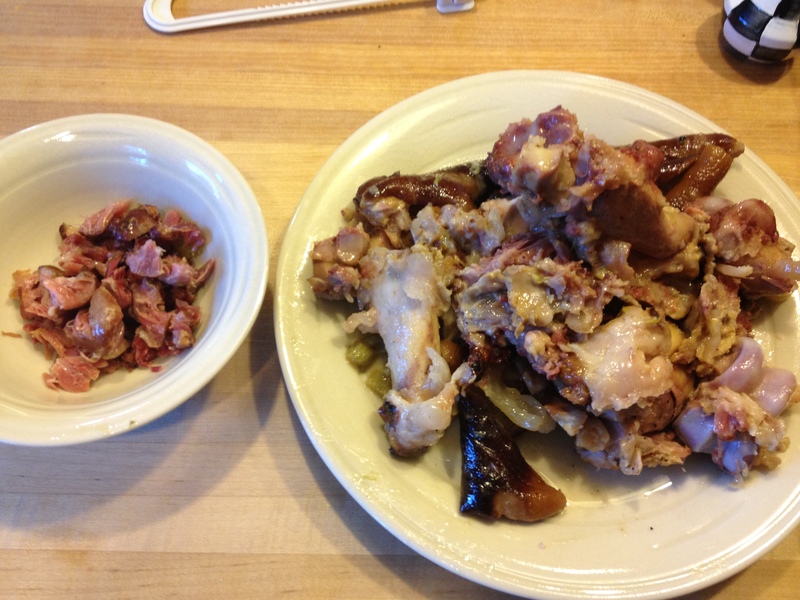 The meat all pulled easily off the bones and I separated the chicken into dark and light meat with the cooked skin in the dark meat pile as well. The broth stayed on the stove uncovered over medium heat to reduce a bit and hopefully concentrate the flavors of the stock. 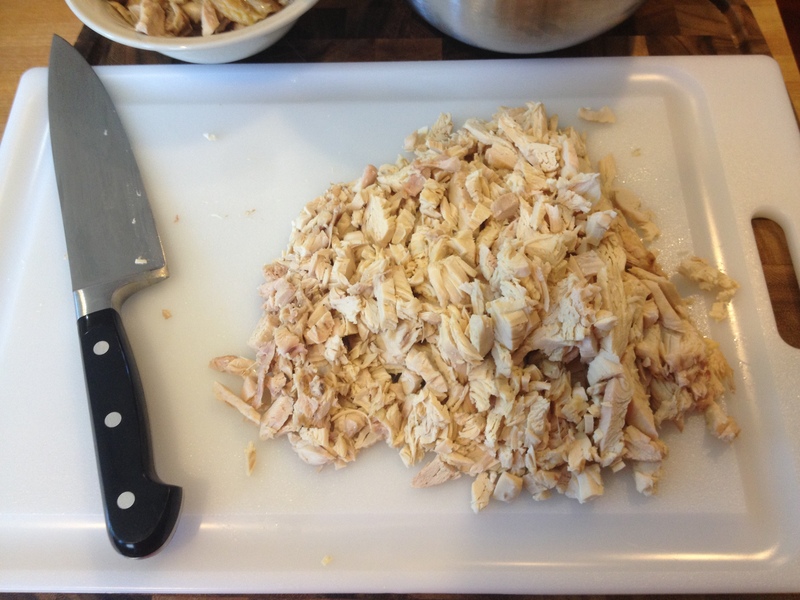 The white meat I cut into small chunks and then chopped the dark meat, skin, and the half boiled onion down to a minced texture. Original plan was to run this through the grinder like the last scrapple but I was feeling lazy and didn’t want to wash all of those parts. So, with a lot of effort and multiple spills onto the floor, I did a much poorer job by hand. Logic! 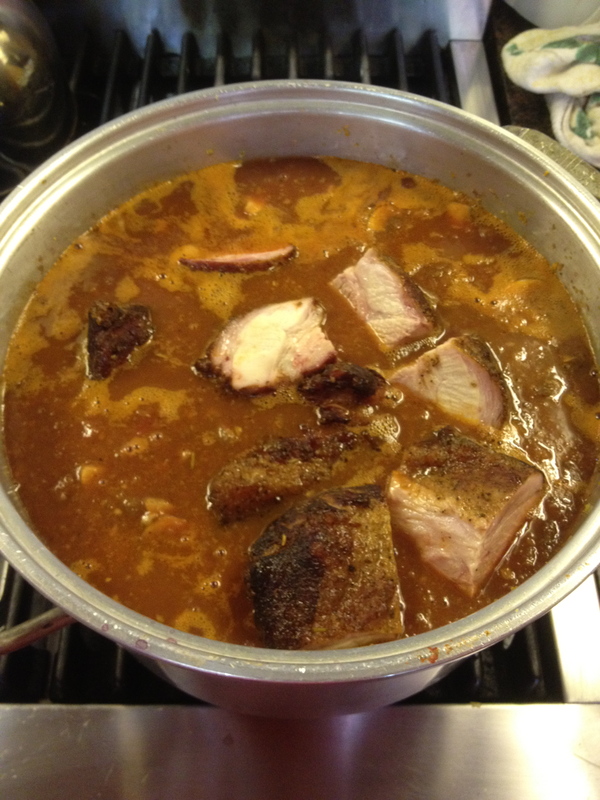 At this point the stock had been bubbling and reducing for 15 minutes or so and had a strong flavor and aroma. 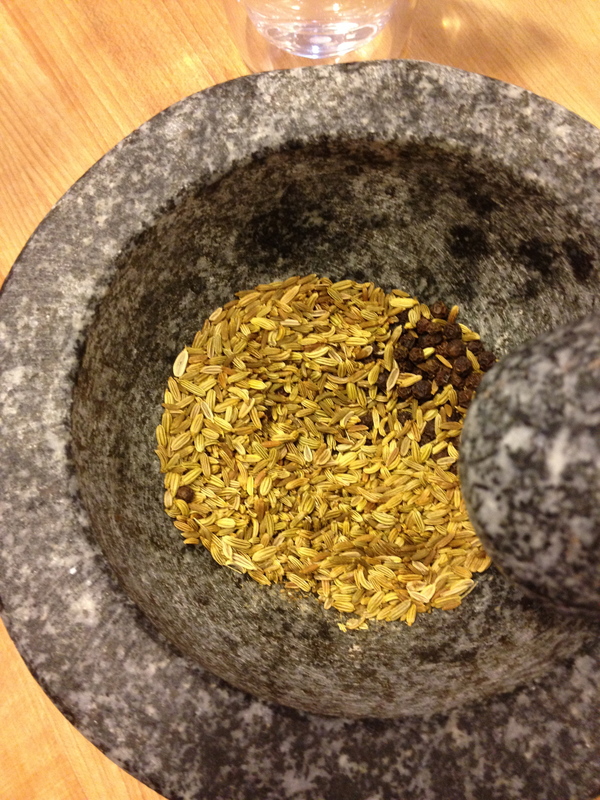 With everything prepped, I added a few pinches of dried thyme, sage, and nutmeg to the stock and stirred them in completely. 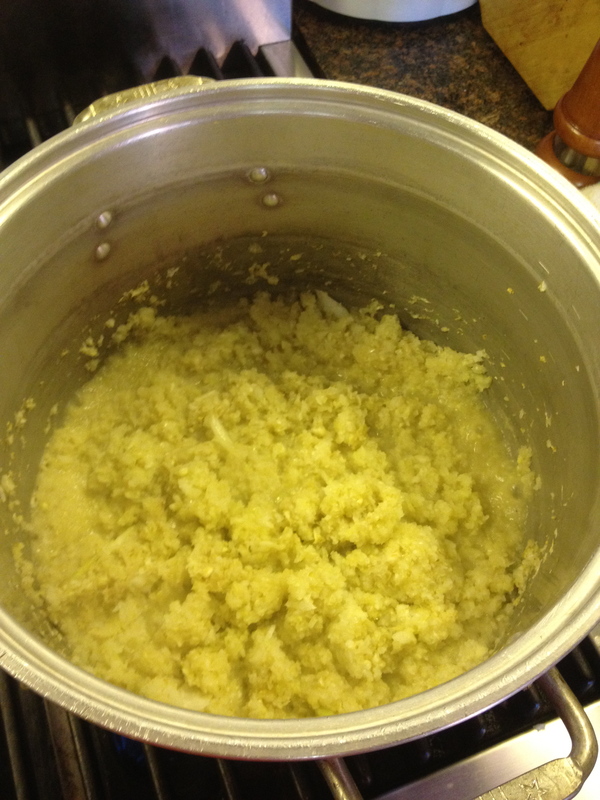 Then slowly started whisking in white ground corn meal until it was too thick to whisk anymore, about 3 cups total. 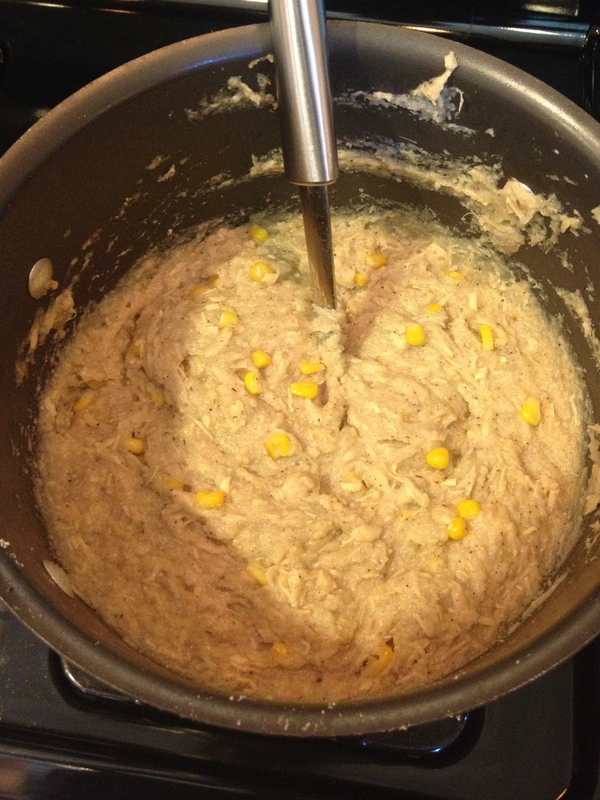 The goal was to get it to a thick cement-like texture, so I switched to a large spoon and stirred in approximately an additional half cup of corn meal. 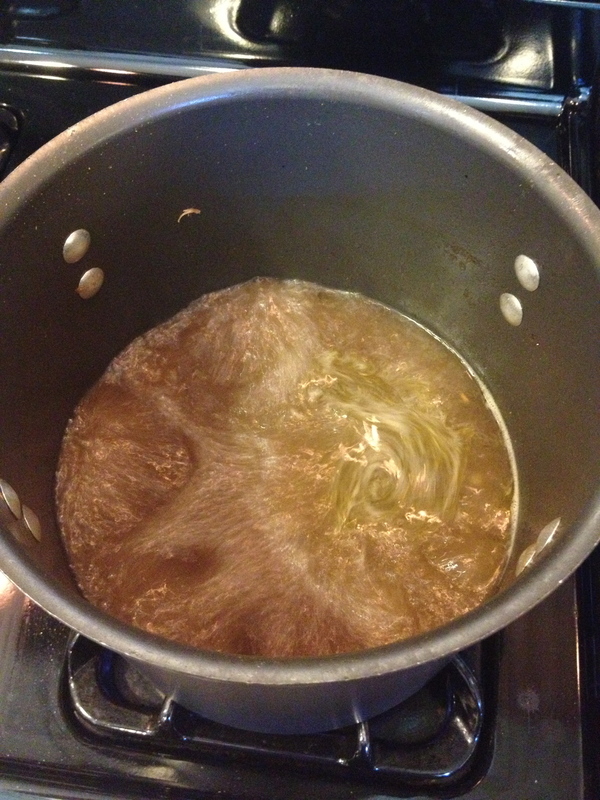 Unfortunately at this point the corn meal needs to cook in the stock for 30 minutes, stirred constantly. 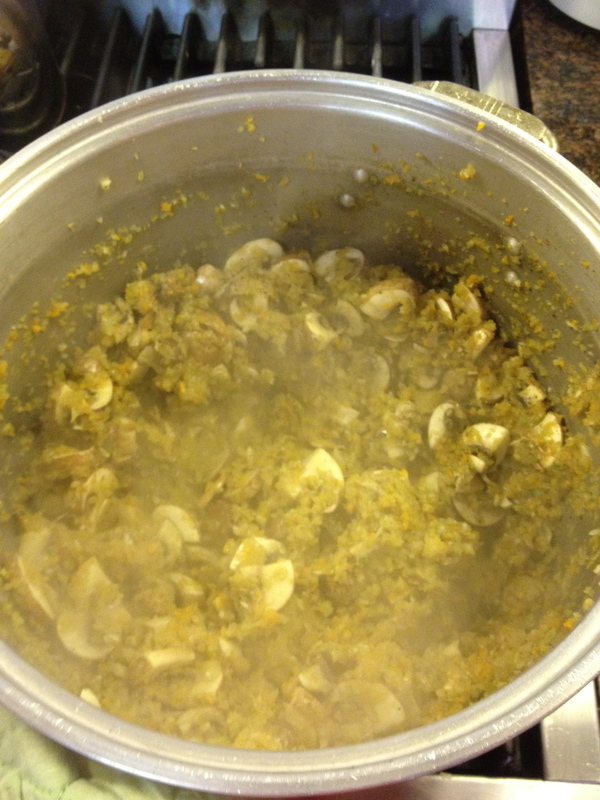 The chopped and minced chicken meat headed into the corn meal and stock along with a couple handfuls of frozen corn and the long half hour of stirring began. Lots of whining and complaining about the pain in my forearm ensued, plus some flexing and making Kristi feel my forearm while pretending I was Robert Irvine or something. The cornmeal chicken mush got spooned into foil loaf pans that I had previously sprayed with a little Pam to prevent stickage. 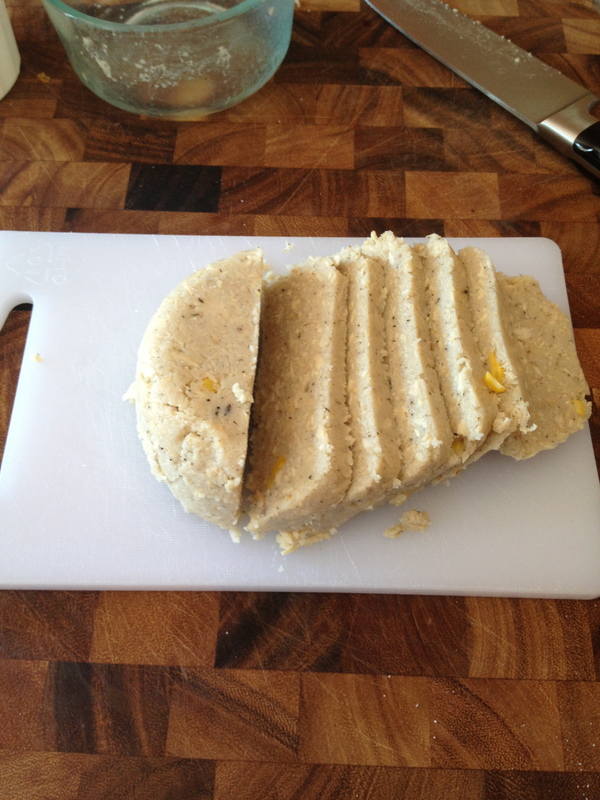 Although I originally planned on making far less scrapple this time around, I think I made more than last time. 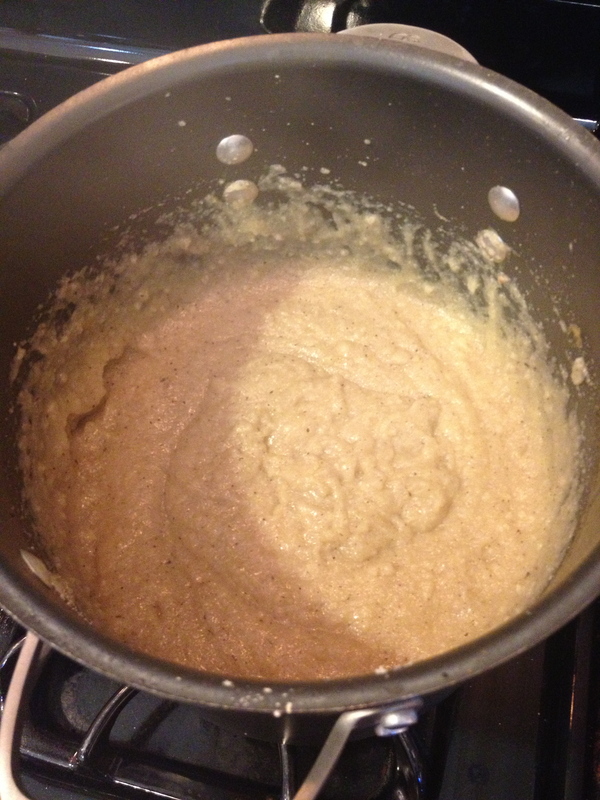 But, this one won’t taste like hog liver pudding so I will (hopefully) actually go through it relatively quickly. After cooling on the counter until they were down to room temperature, I covered each loaf pan with foil and transferred to the fridge to set completely overnight. Once set, each loaf was popped out of its pan, individually bagged, and vacuum sealed for the freezer. 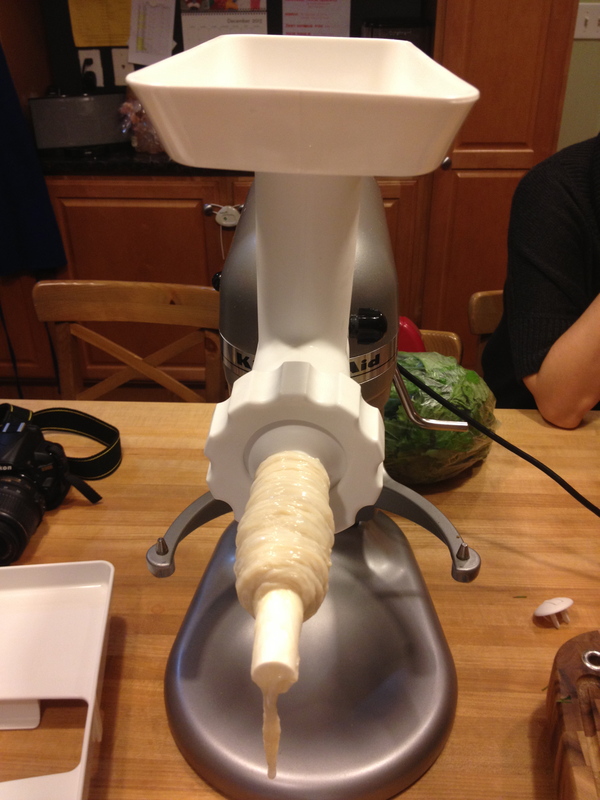 But the round one needed to be sliced and eaten the following day (or so I told myself). The scrapple went into a hot pan with a little olive oil to crisp on both sides, then served traditionally with a couple over-easy eggs. 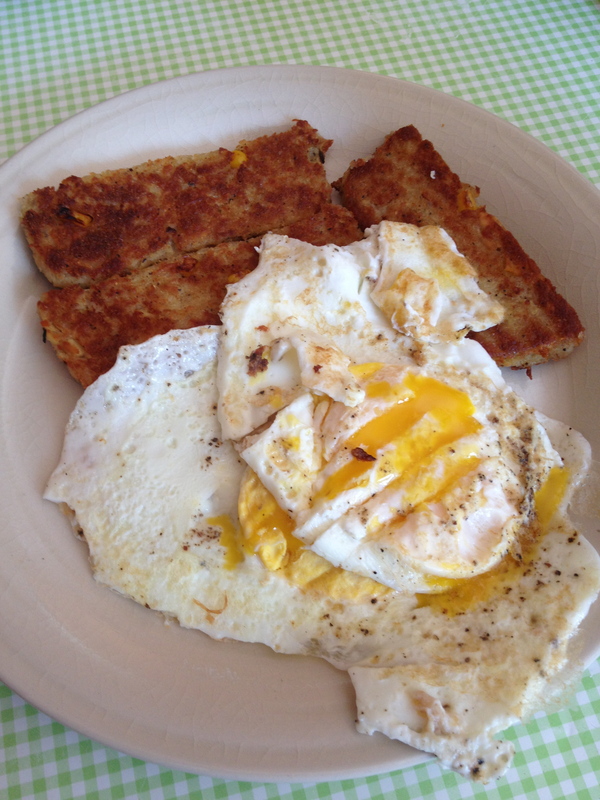 The scrapple had a lot of flavor and the texture that I love in scrapple; crispy outside with a soft texture inside. 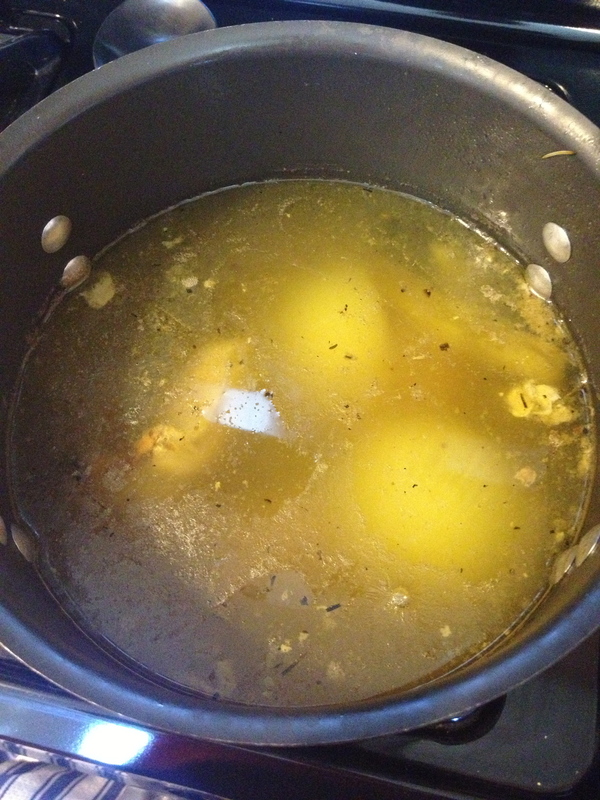 It went perfectly with eggs, particularly the rich flavor from the yolks. 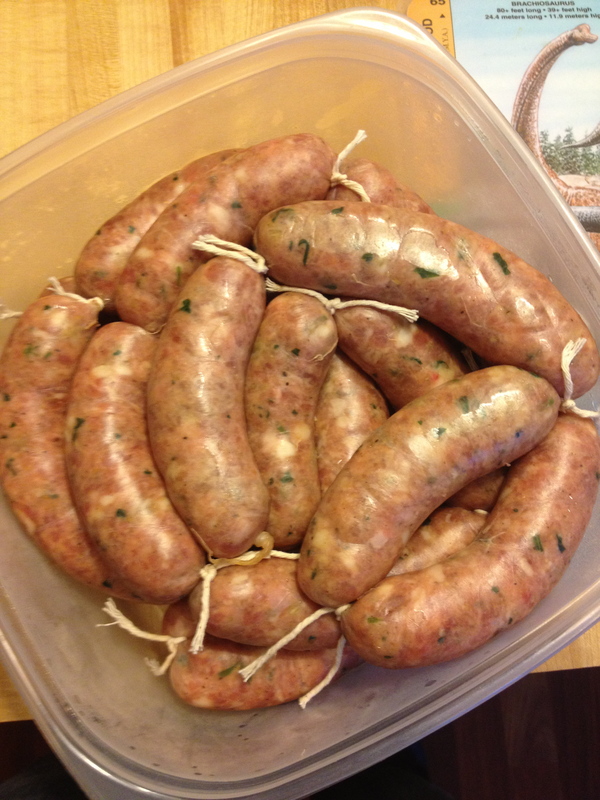 Not quite as rich and meaty as the pork version, but a decent substitute that might be a little bit better for you (though I am the last person you can trust on that type of assertion). While eating it with breakfast, I had a thought that it would go equally well as a dinner course as well. 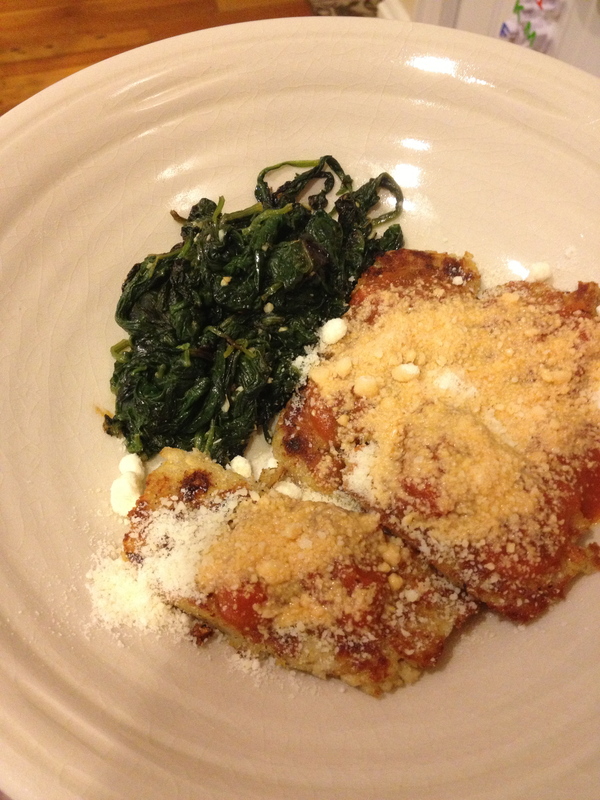 So later in the day (and again a week later) I served it griddled crispy with a little sweet & spicy marinara and grated parmesan cheese. The sweet sauce and the cheese work really well with the scrapple, even if Uncle Timmy thinks it is sacrilege. Stupid nerdface overgrown cucumbers Tim. 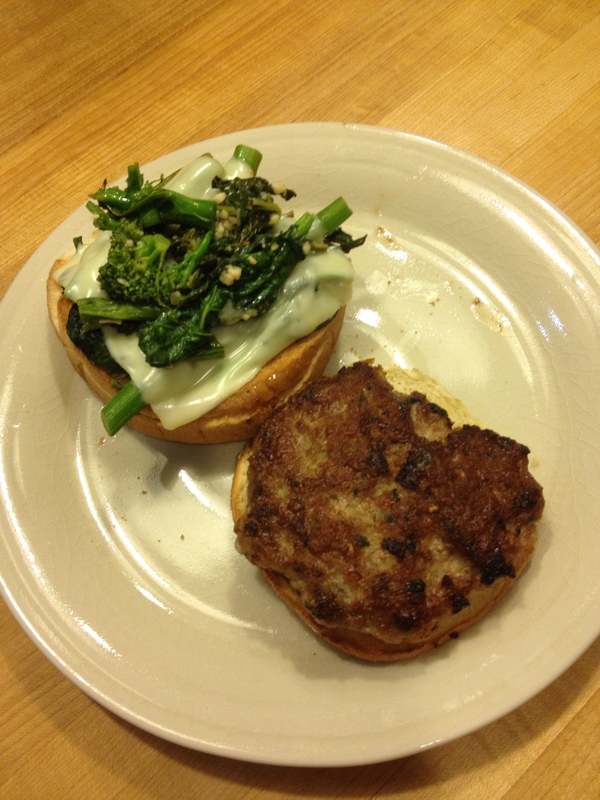 I will likely use this both ways in the future since this was equally delicious and easy. And, Janet likes it too, which was the original point anyway. Next week I will get back to those rotten trout parts. 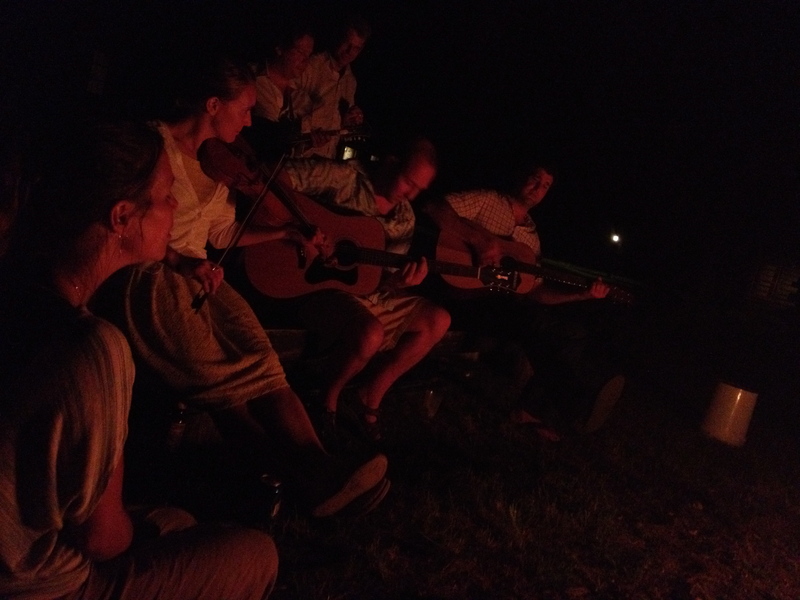 We spent July 4th down in LBI with our friends John and Liz since the Ryan residence is still out of commission from Sandy. 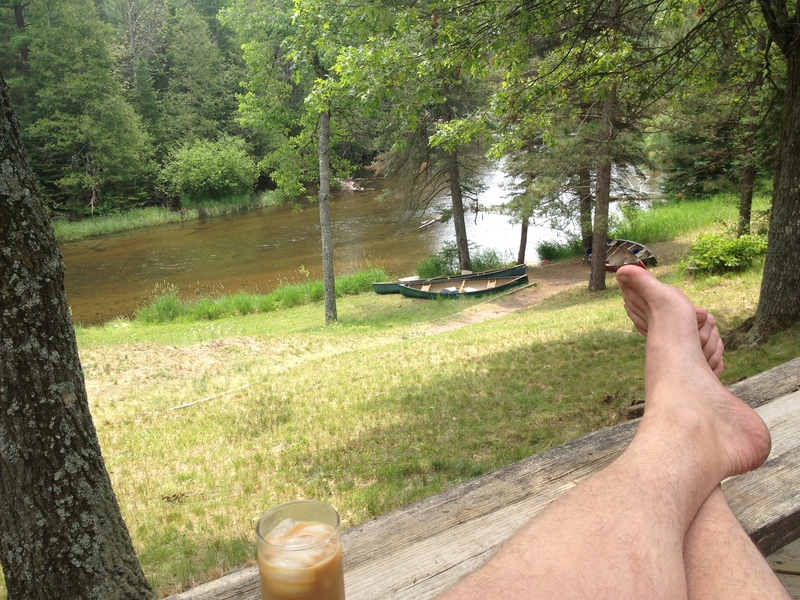 As mentioned last week, I was a typically awful houseguest: serving offal to unsuspecting children, snoring on couches, and complaining about hot pepper juice I rubbed in my own eyes. 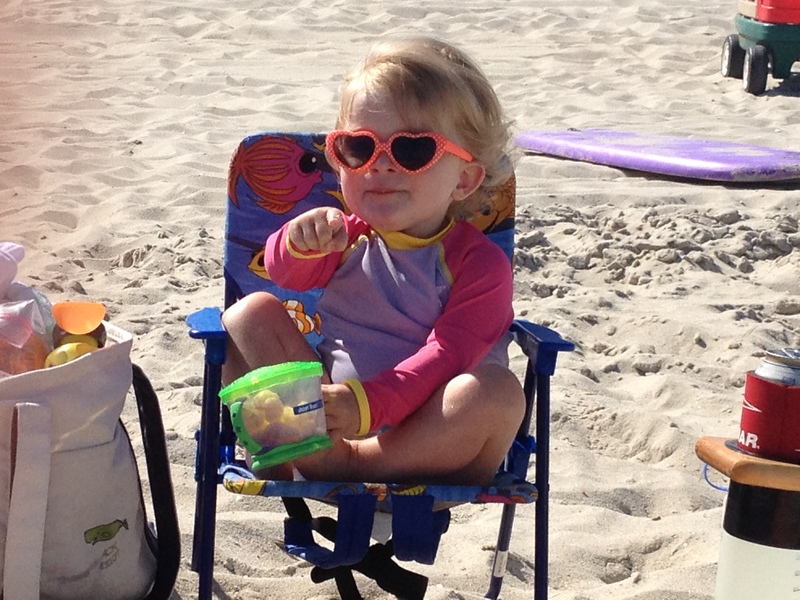 There was no fishing or clamming on this trip, but lots of relaxation on the beach and deck. 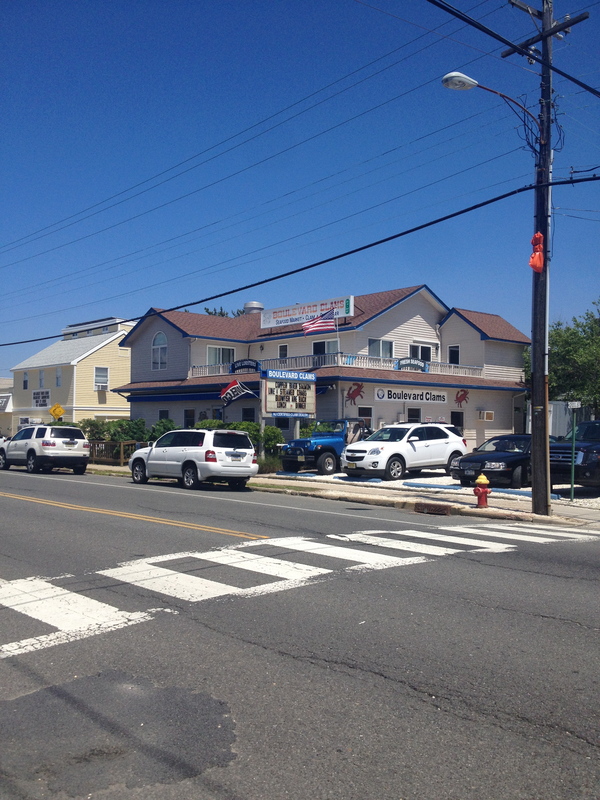 However, on a ride down LBI Boulevard the first day to pick up food for dinner, I noticed that a few of the seafood shops were advertising blowfish on their signs. Not only advertising them, but doing so excitedly (meaning: exclamation marks). If you look really closely, so closely that you’re not really sure whether you are actually seeing it or just pretending you can see it, you’ll see that the sign says “Blowfish are back!”. That sign is there because, well, blowfish are back, and you should be excited about that. Me, I was pretty excited. You ‘cited? I’d definitely encountered a couple blowfish diving over the years, but I’ve never cooked or even seen them in their cleaned, raw form before. Aside from the early Simpsons fugu episode where Homer almost dies from eating poisonous blowfish, I can’t say I had even thought of them as food, really. I guess they are relatively innocuous looking. But, I mean, seriously? This is food? When we went into Boulevard Clams, I had no idea what the blowfish meat would look like; I would have believed anything from a deflated basketball to a beautiful fillet. But, what they actually looked like was entirely logical. Almost boringly logical. The general anatomy and how much of those fishies were edible was a complete mystery to me, and as usual the yokels at the store weren’t much help. What do they taste like: “chicken”, how do you eat them: “like chicken”, whats the best way to cook them: “jest fry ’em up”. I know, we were in New Jersey, not some backwoods locale, but good lord were these guys unhelpful and yokelish. 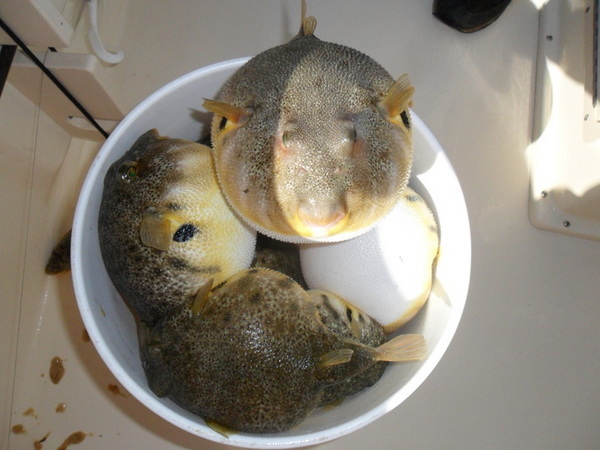 That said, they have a customer for life as long as they carry blowfish every season, and for $9.99 a pound no less. With no creative cooking ideas and not wanting to stink up the house frying things inside, I decided to keep it relatively simple and put a sautee pan over medium/high heat. 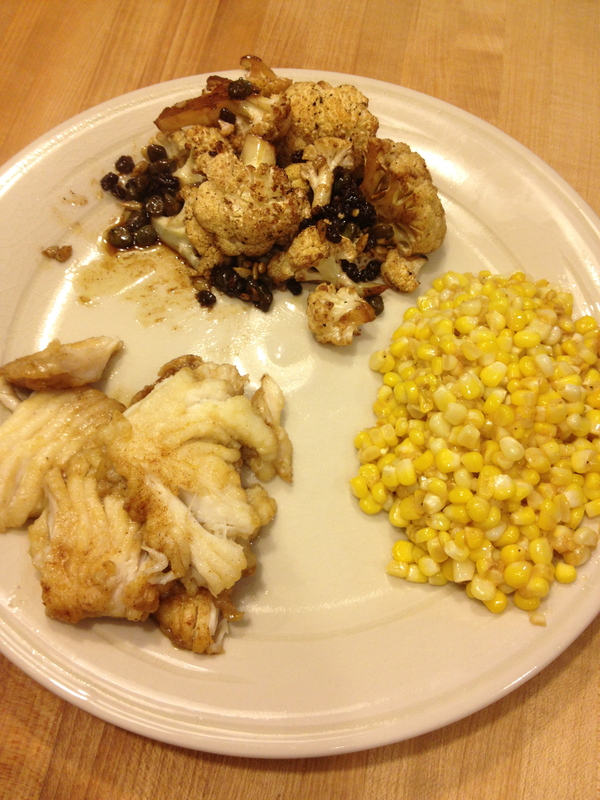 While it heated, I salted and peppered each piece of blowfish. 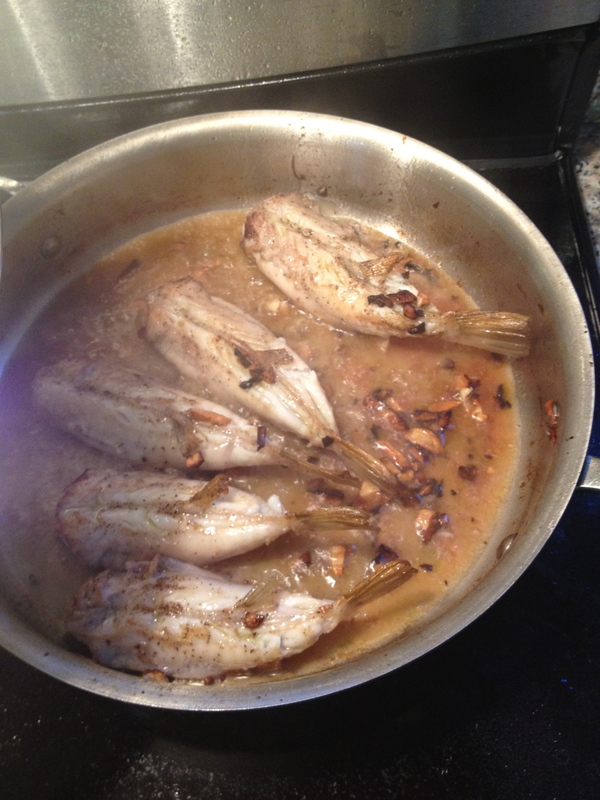 Once the pan was hot, I added a little olive oil and a couple cloves of chopped garlic then the blowfish. What I meant there was, once the pan was way hotter than it should have been I added all that stuff. After a couple minutes on one side, I flipped the fish, added a solid pour of rosé (it was open), and put the lid on to finish the cooking. After another 3-4 minutes I moved the fish to a plate, reduced the last of the wine in the pan to thicken into a sauce, and poured it over the fish. A little squeeze of lemon over the top, and it was ready to be served. After tuna fishing last year, I babbled about what a perfect fish tuna is for how easily the loins come off and how much is edible. I was even more impressed with the blowfish. 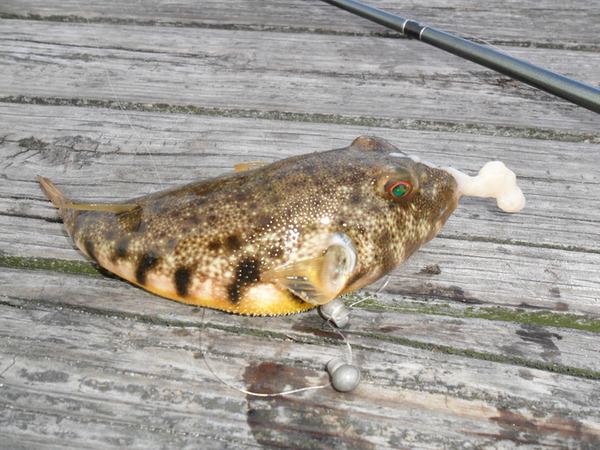 The spine is directly attached to the fins on the top and bottom and has a flat center bone that runs up the whole fish. The meat comes off in two large pieces, one on each side of the spine with no bones in the meat, and no other picking needed. As far as the taste, I don’t know if this was extremely fresh or something, but it was much much better than I expected. 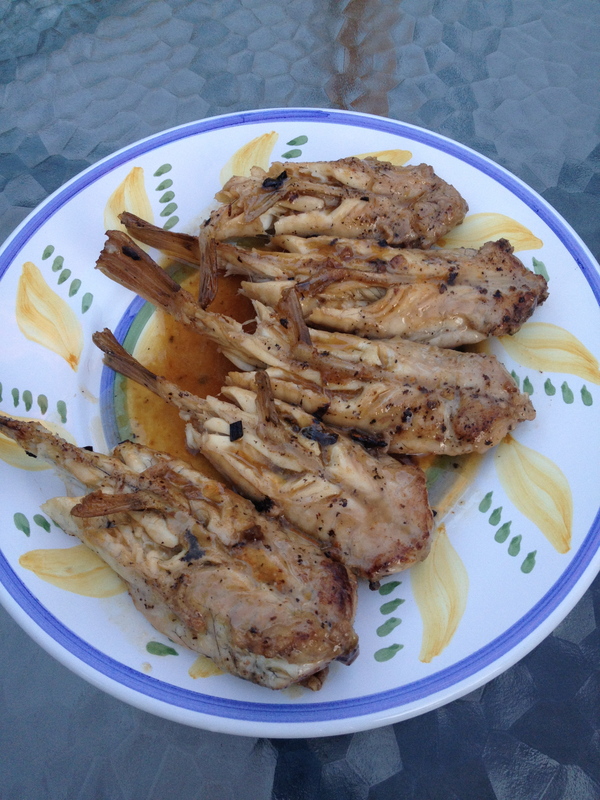 The meat was rich and slightly sweet with none of the fishy flavor you expect from a darker-meat fish. The texture was buttery and soft like properly cooked cobia, and the collagen from cooking on the bone coated your lips when you ate it. As usual I base whether or not I am the only one who would find it tasty on the reactions of others, and three people besides myself ate the blowfish and had seconds. Including Kristi. See! I don’t always just make up the fact that things taste good, sometimes its true and stuff! Hopefully more fish for next week, if I can figure out when the sketchy docks in Little Compton open this time around.